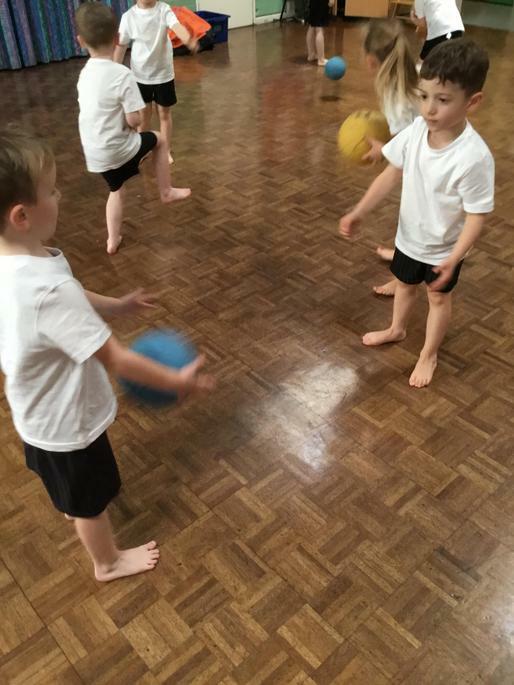 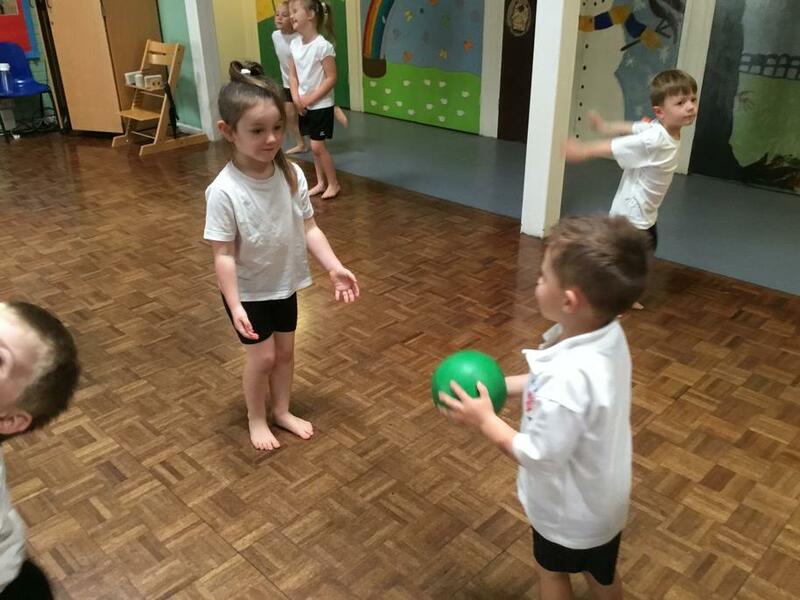 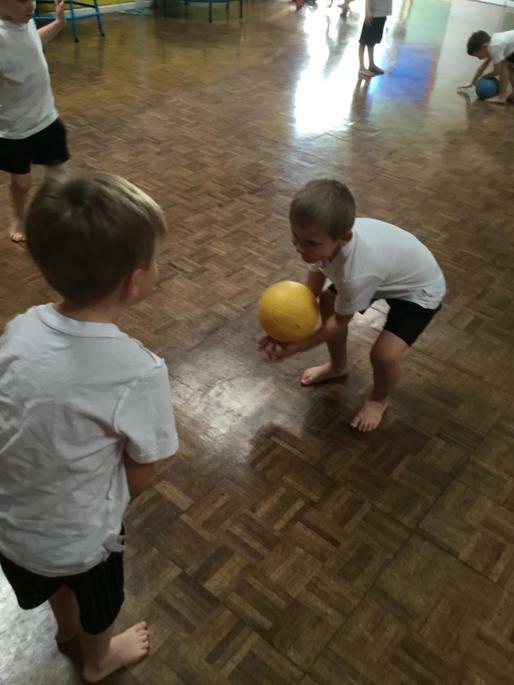 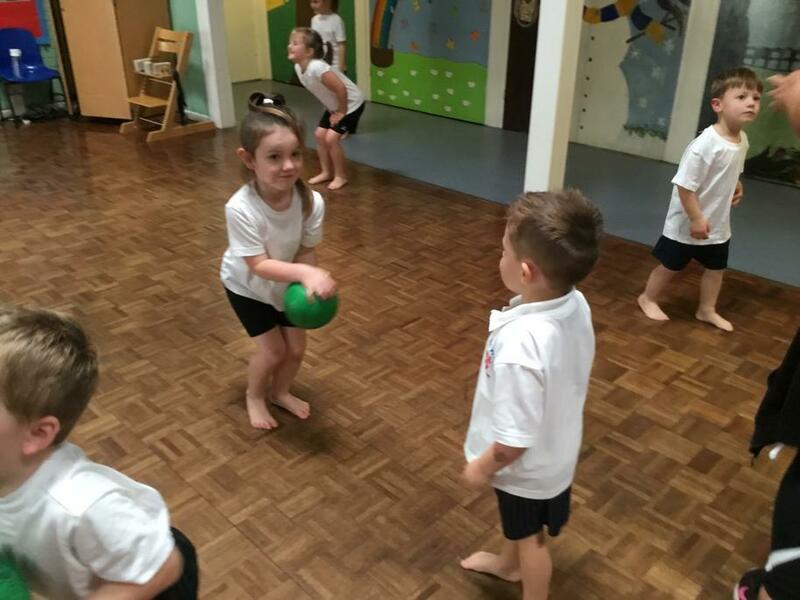 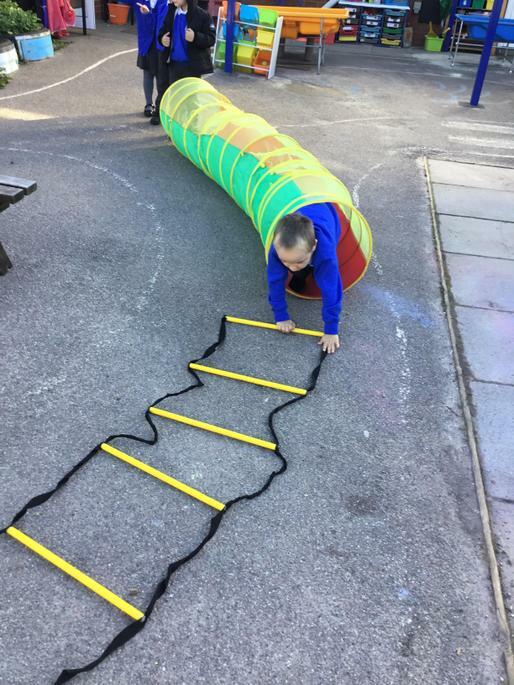 What a great way to end our final week of the half term in Reception. 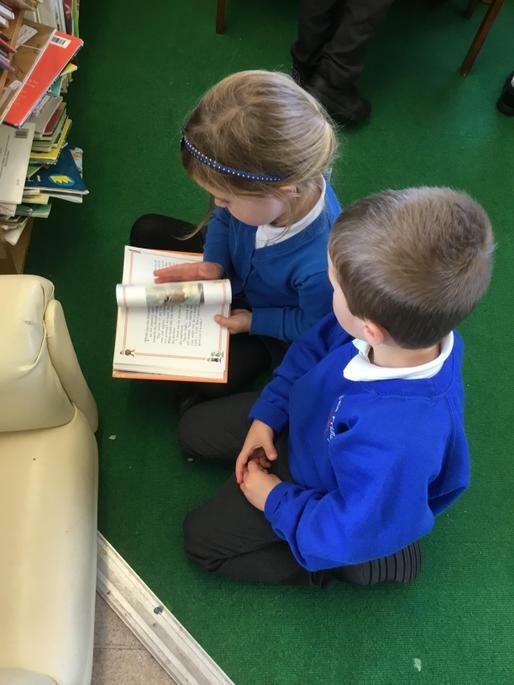 In preparation for Halloween, we have been reading the story “Funnybones”. 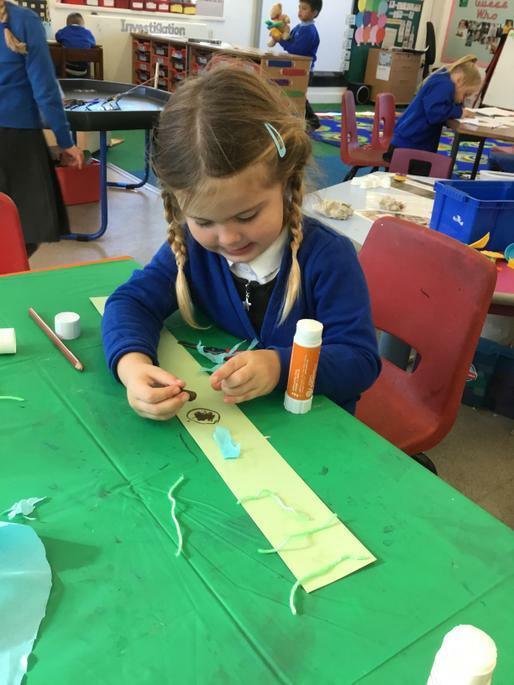 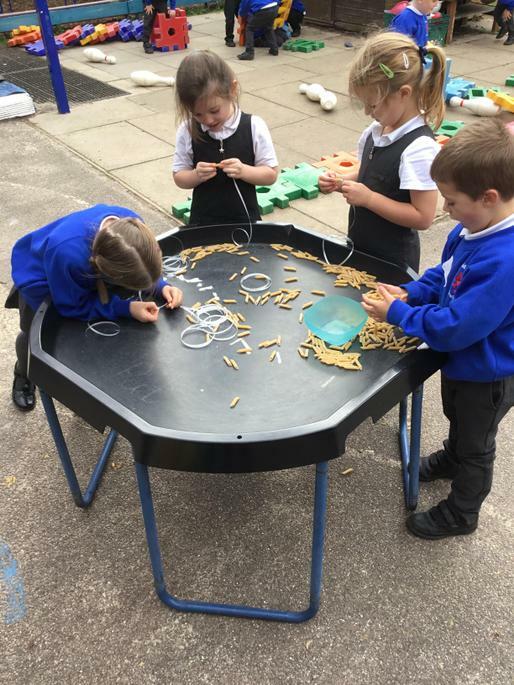 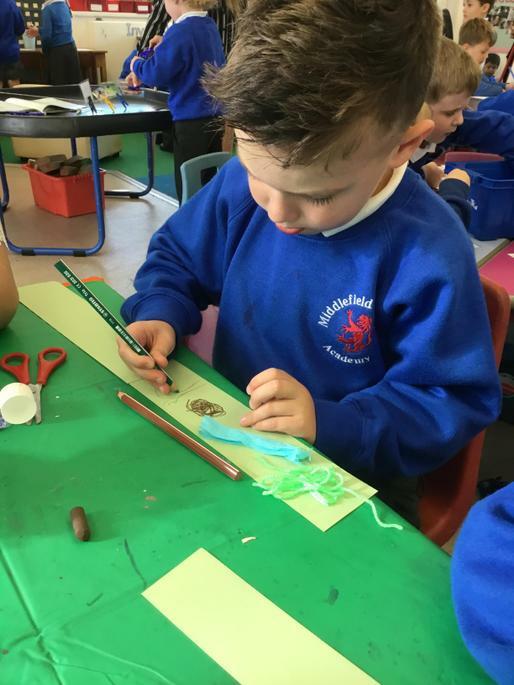 The children have been picking up on the repetitive language such as dark, big, little, and dog from the story, as have been busy having a go at writing some of these words during their child initiated play, as well as creating our own skeletons using art straws and glue! 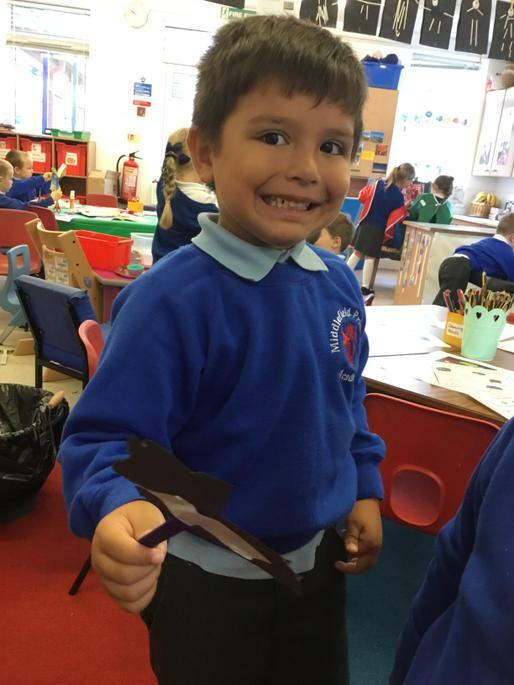 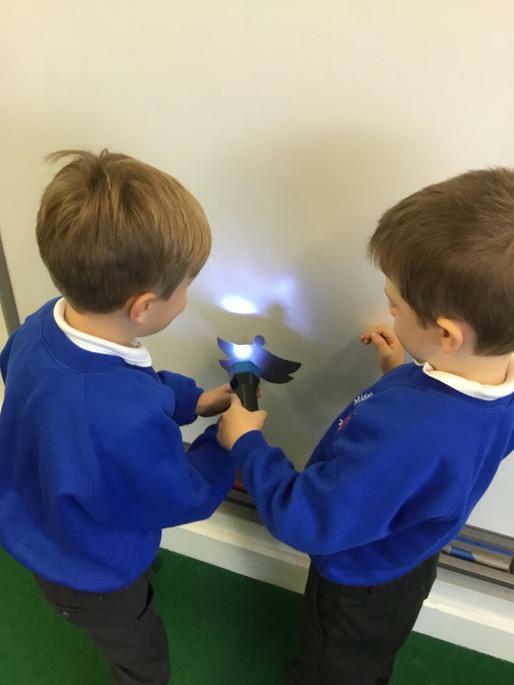 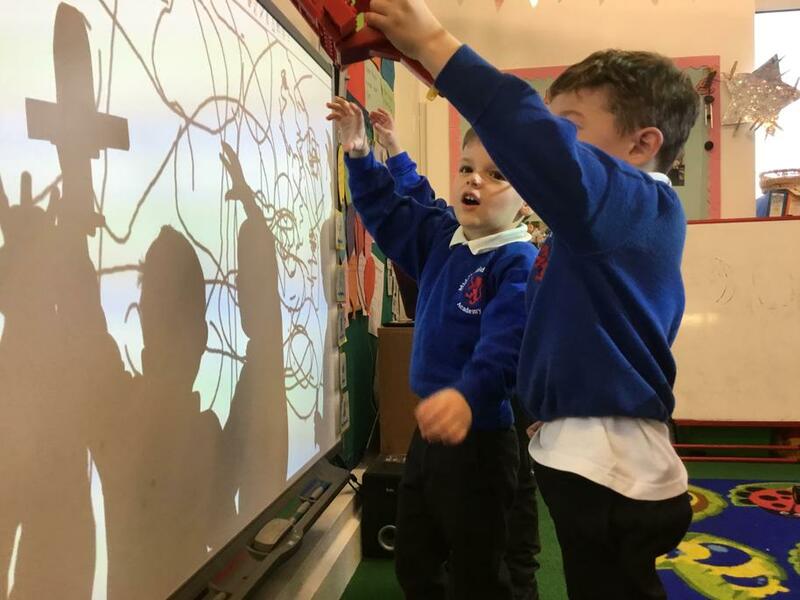 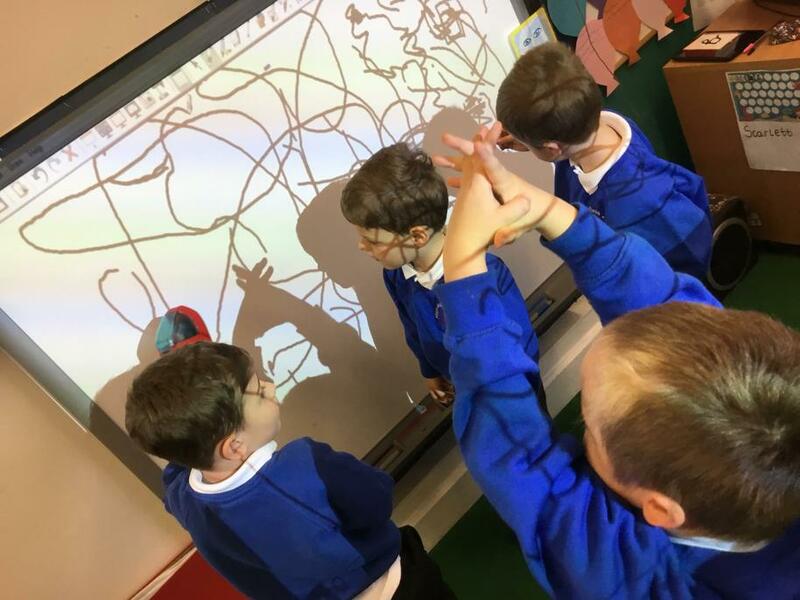 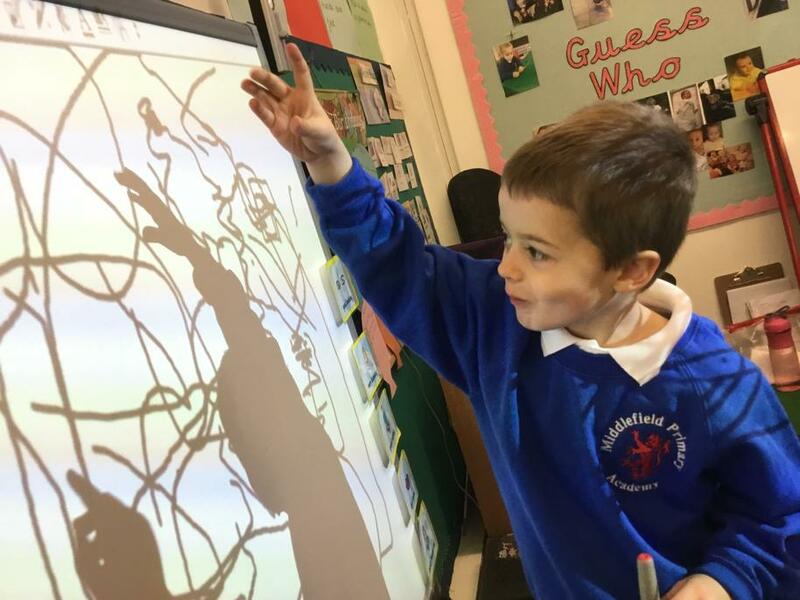 We have also been thinking about light and dark and why it happens, with children then venturing to create their own shadow puppets using torches and the interactive whiteboard! 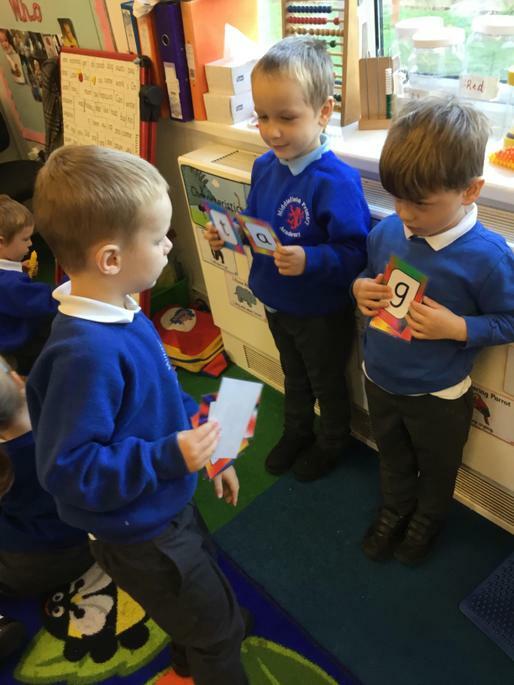 It’s been great fun. 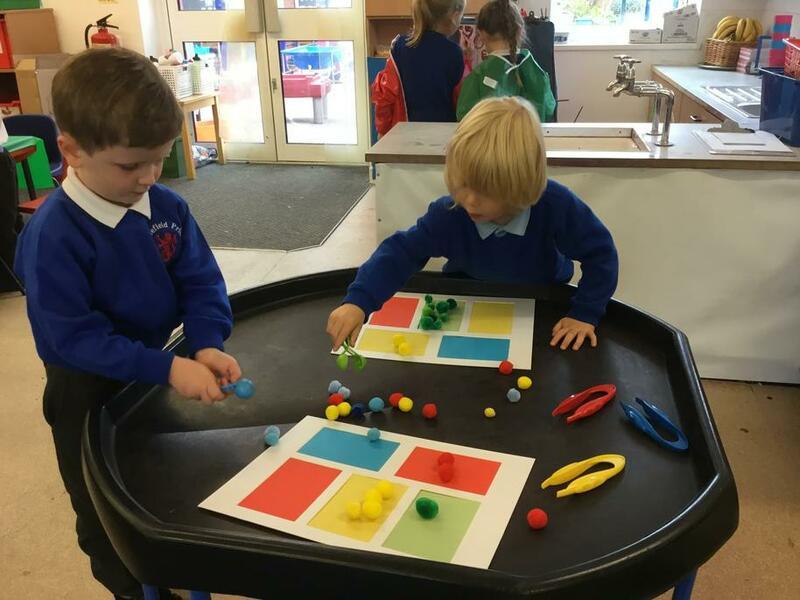 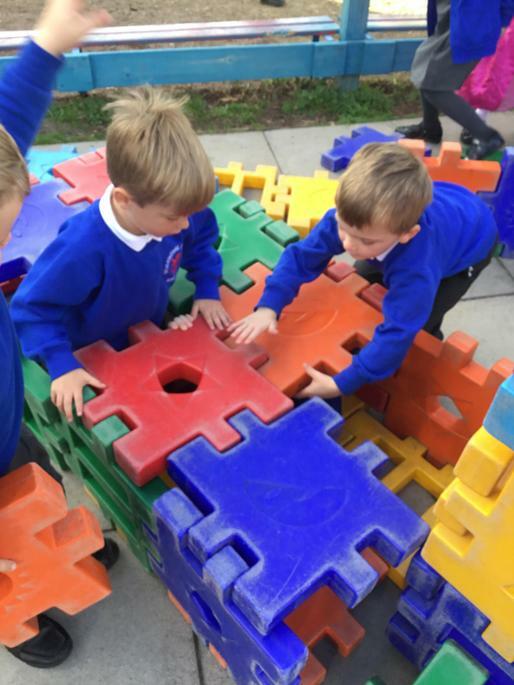 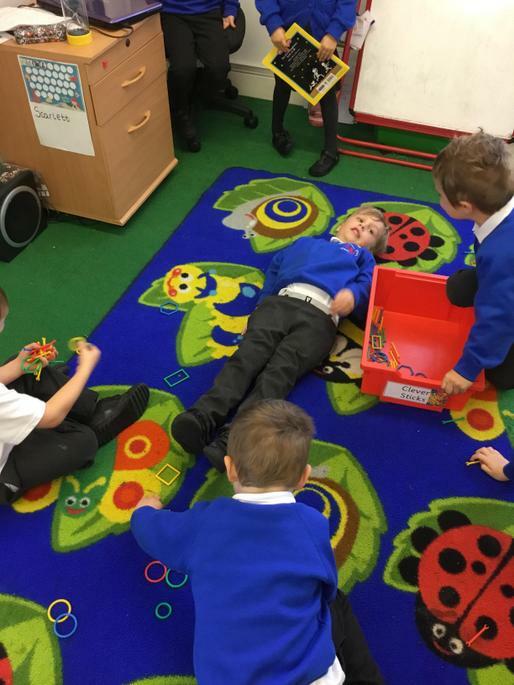 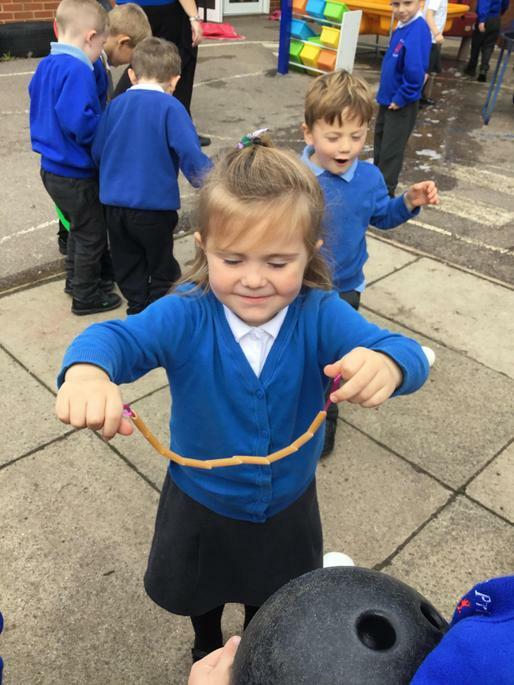 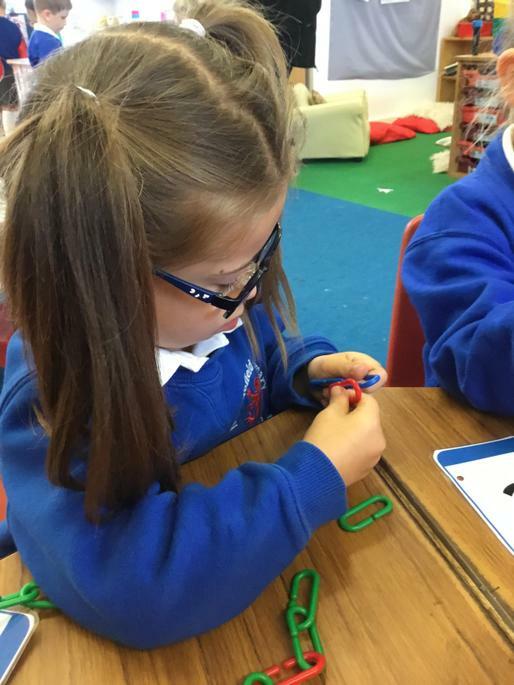 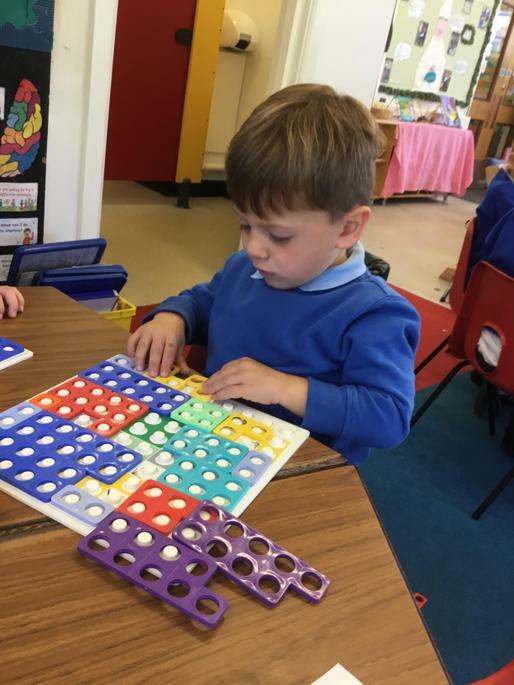 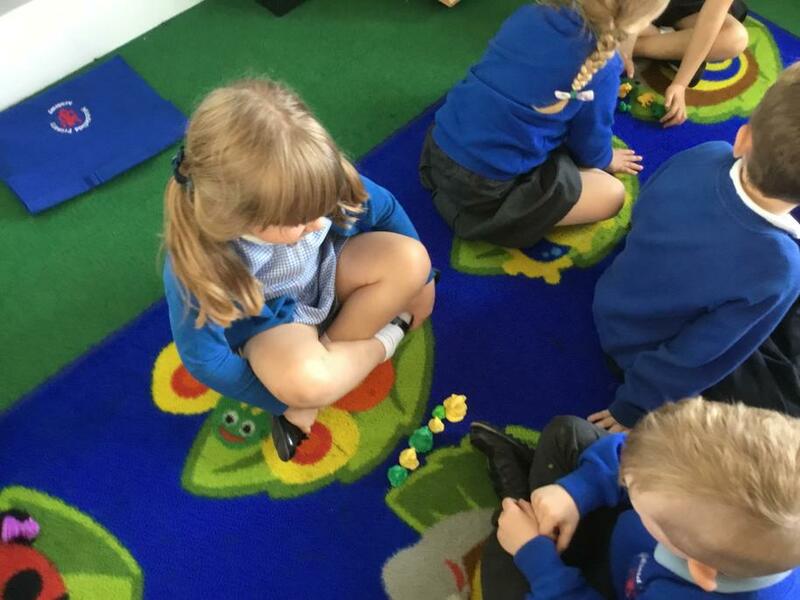 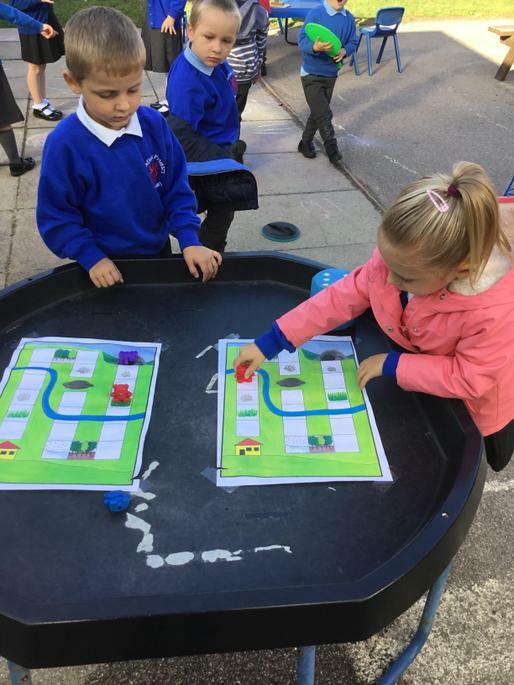 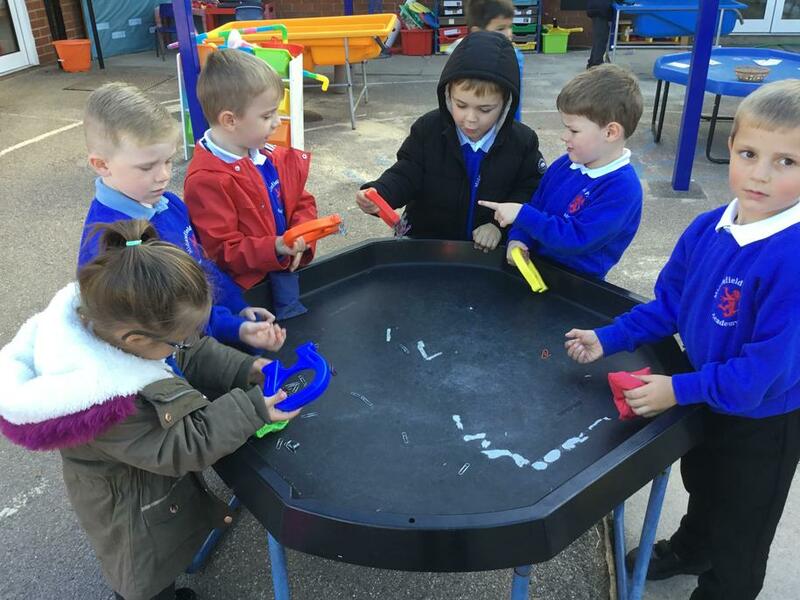 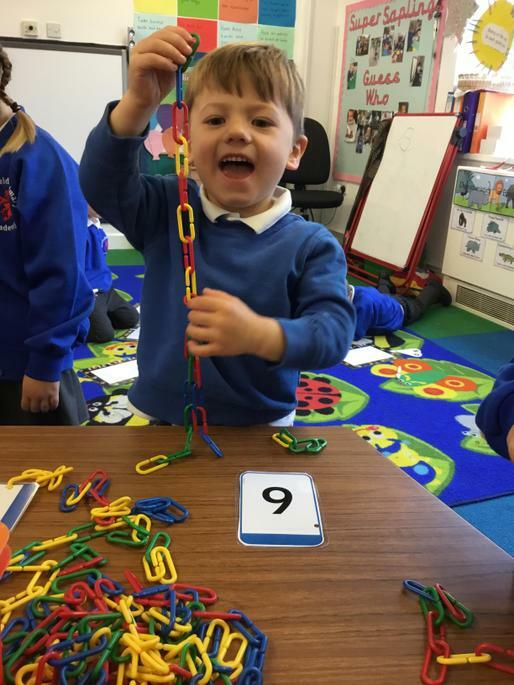 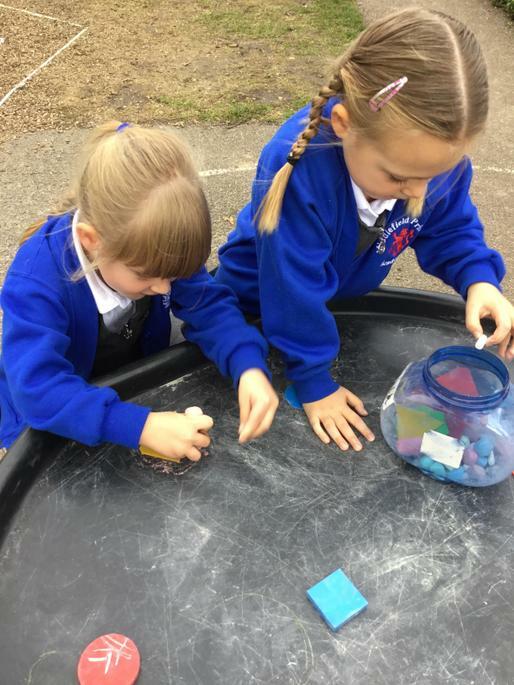 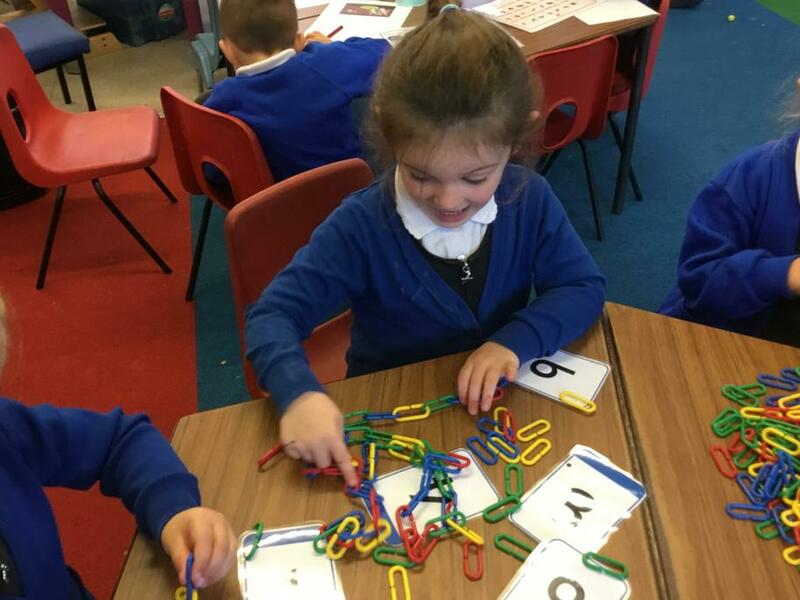 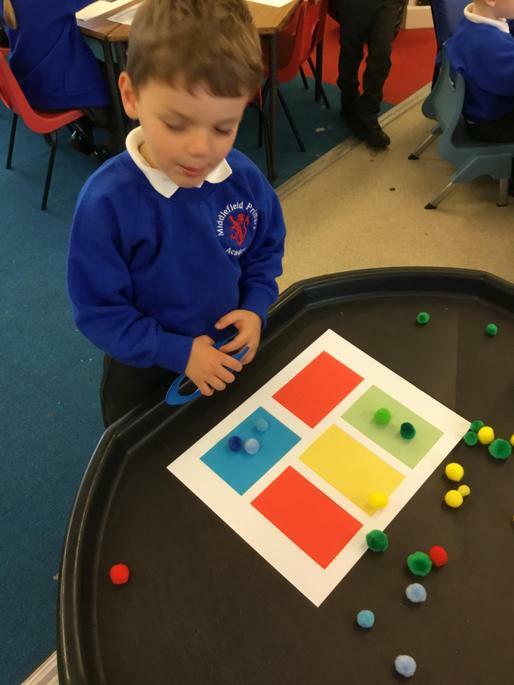 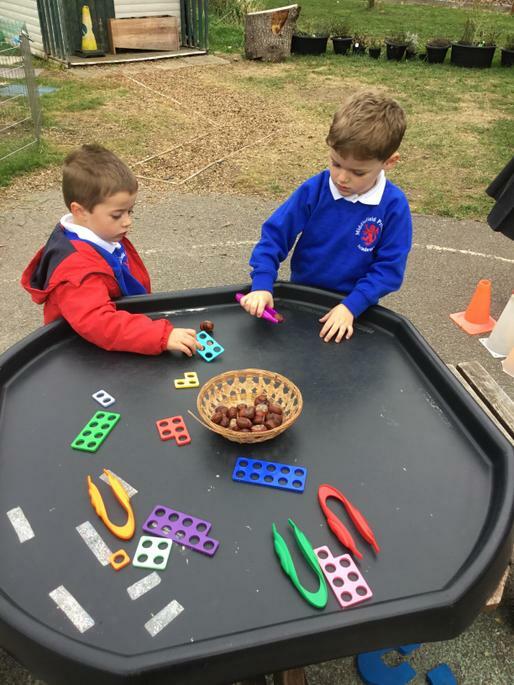 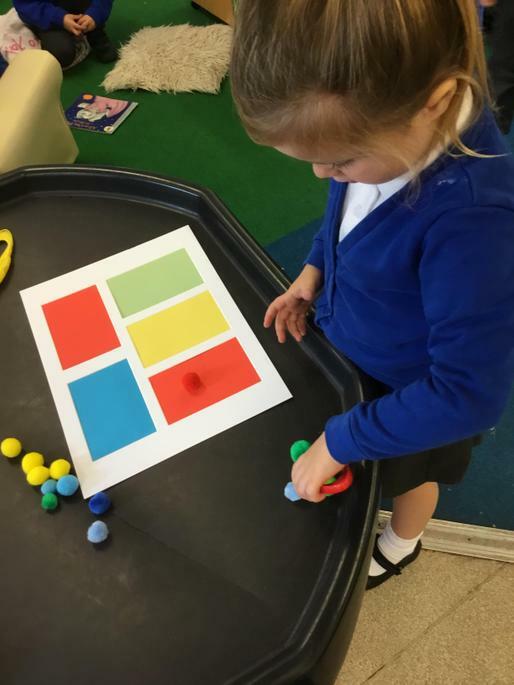 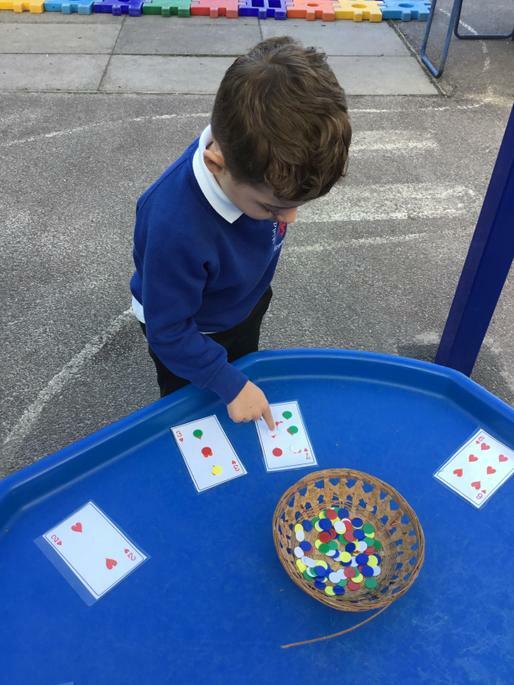 In maths we have been busy measuring using non-standard units, such as cubes and “bones”, which has then extended into the children’s play. 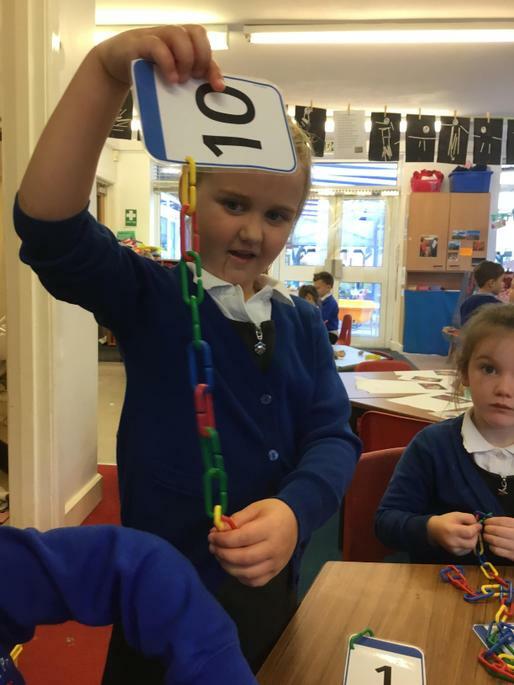 We have also been junk modelling houses for the Funnybones, matching numerals with quantities, and creating pasta necklaces! 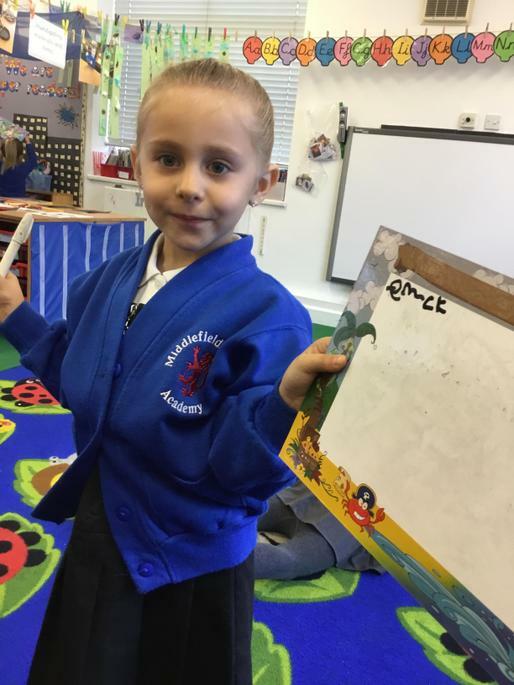 Today I will be sending home “key word books”. 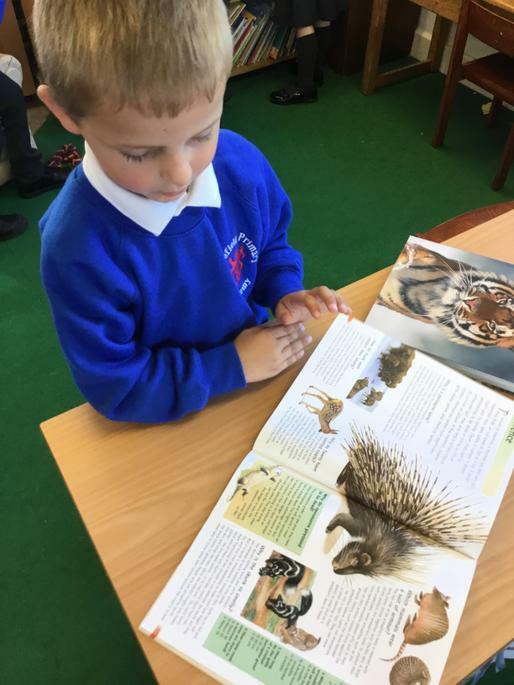 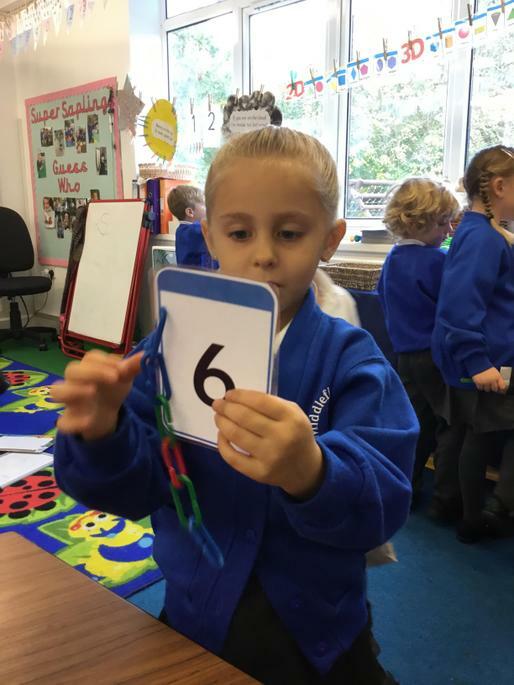 Every child will be set a small number of key words from their first 45 key words to practise reading at home. 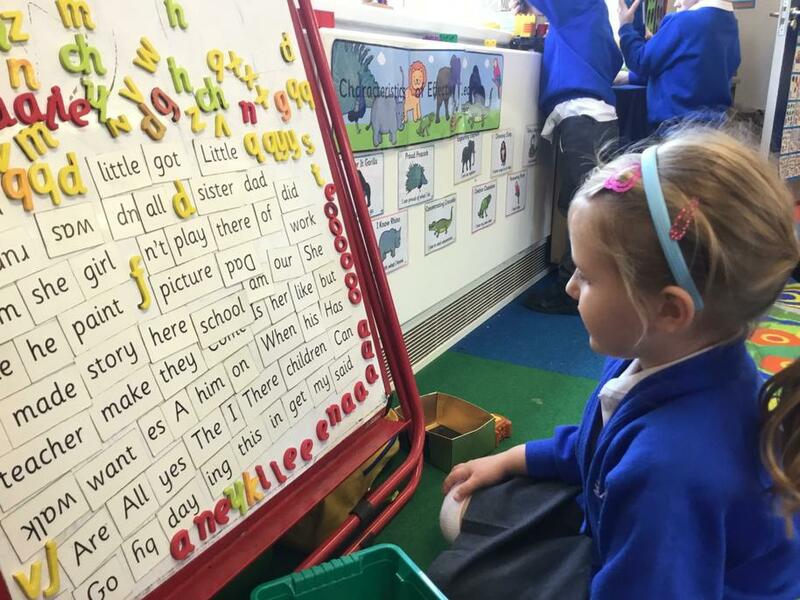 To help children develop fluency in their reading, they need to be able to read these common words by sight, e.g. 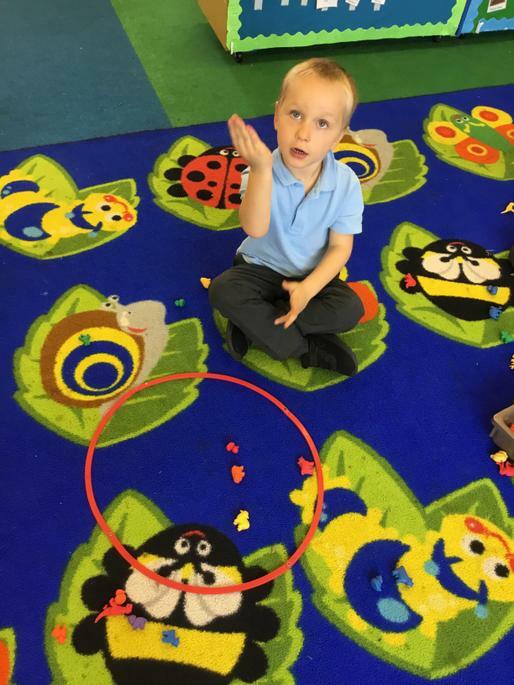 “and, the, in”. 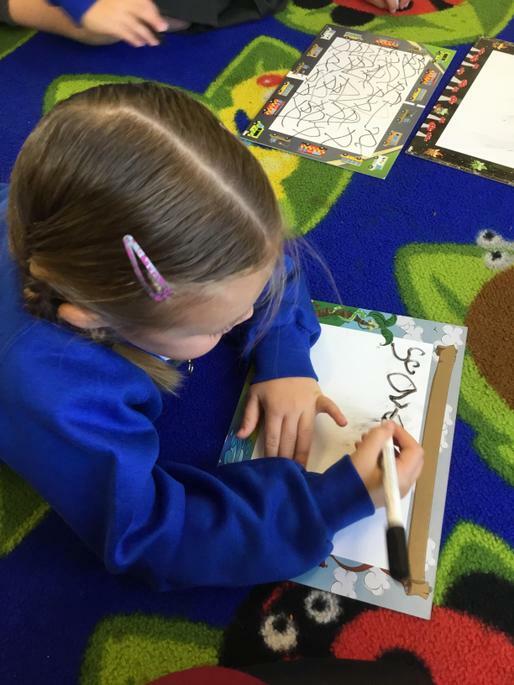 We will check their key words every Friday, and set new ones accordingly to practise at home. 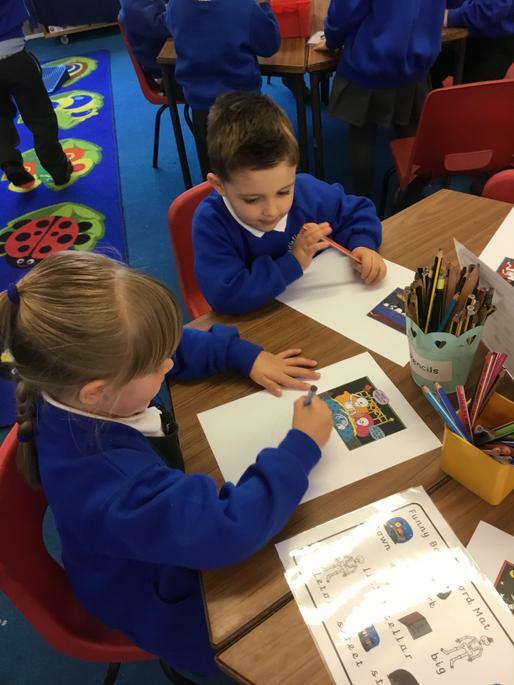 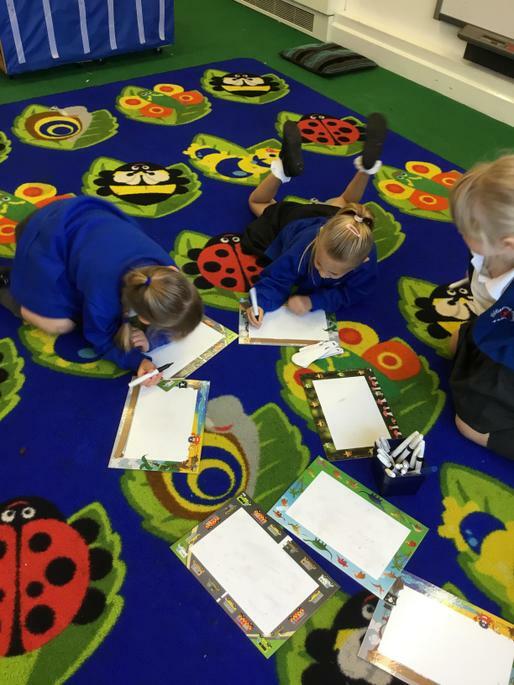 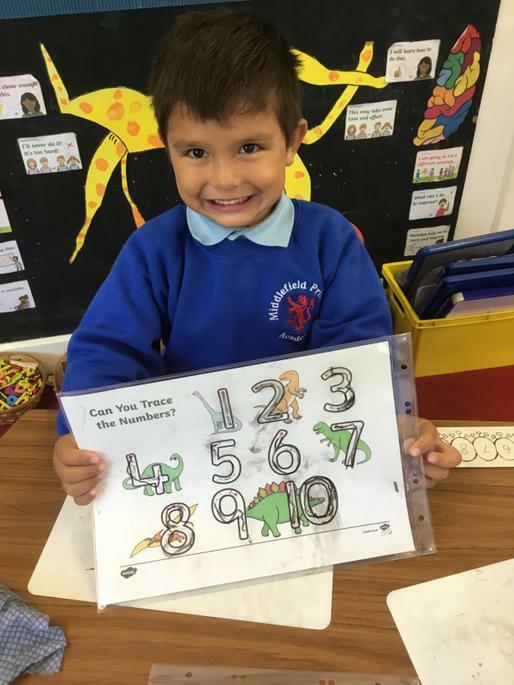 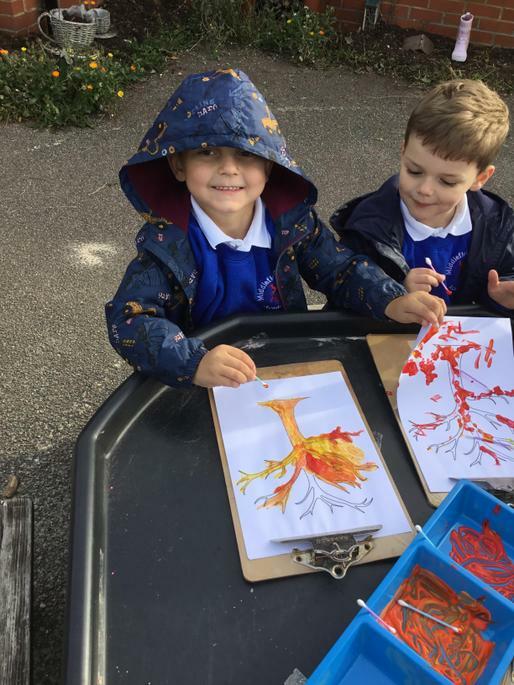 This week in Reception we have been learning how to write a list, and the children have been busy writing a list of what to take on a dinosaur hunt! 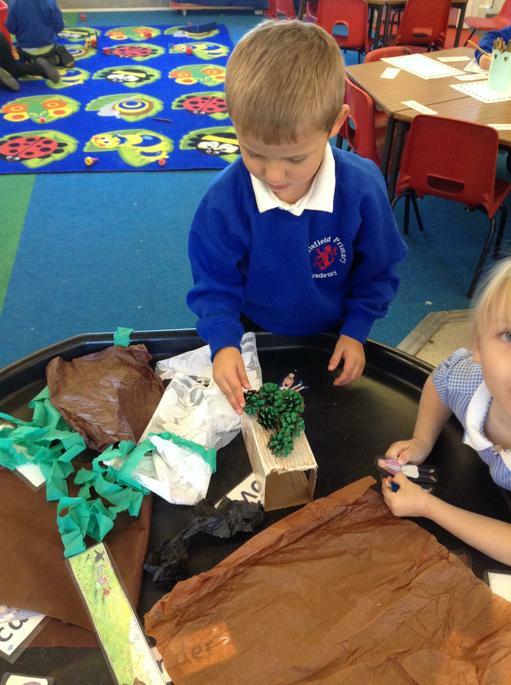 Some of their ideas included a torch, binoculars, a bag...and some meat! 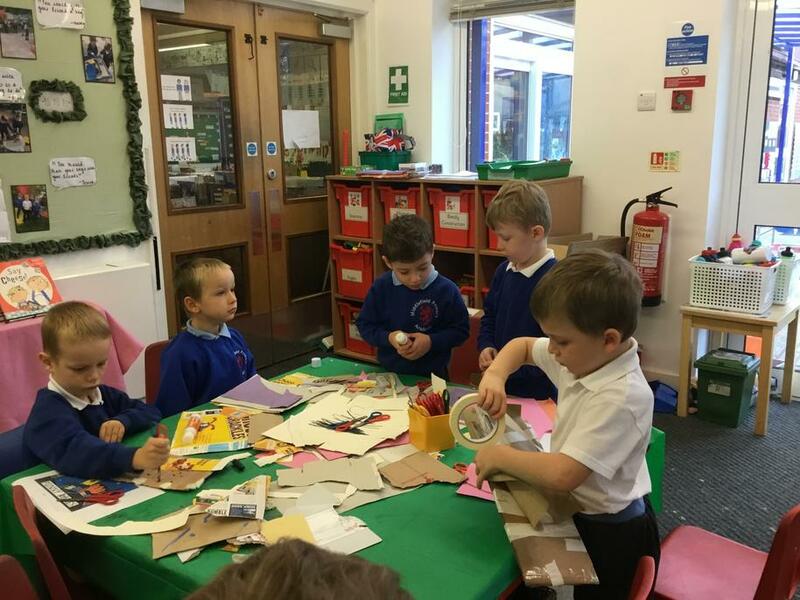 Great ideas everyone! 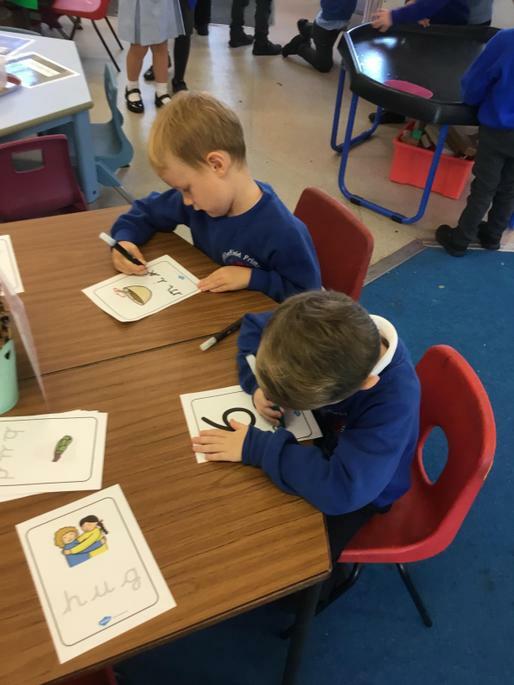 The children have been working hard when forming their letters, and we have been practising this further in our phonics lessons. 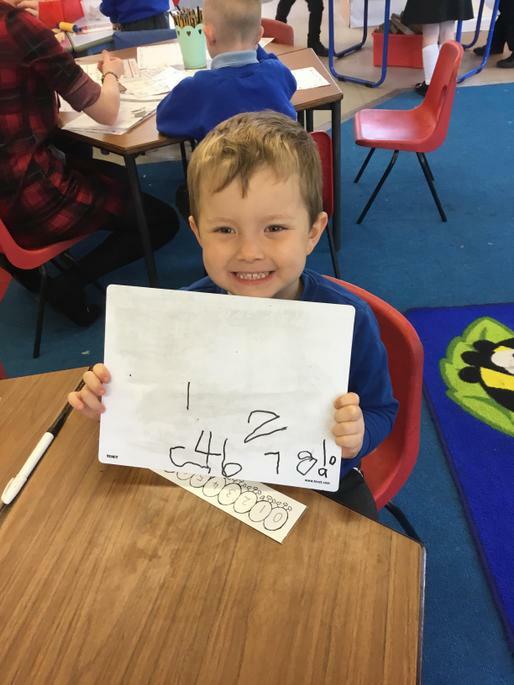 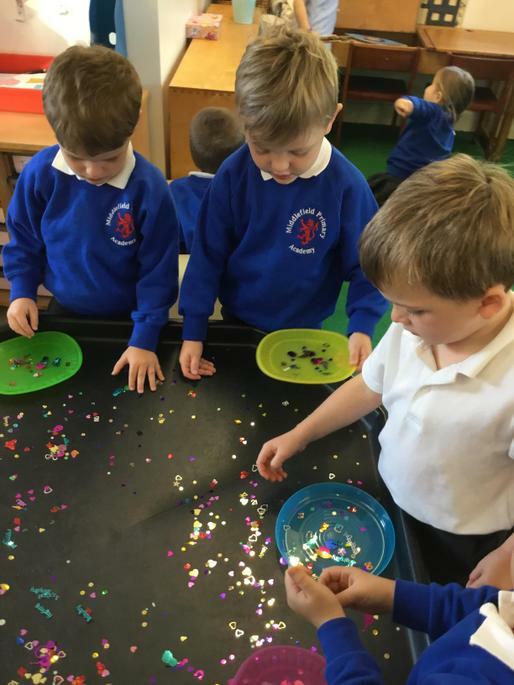 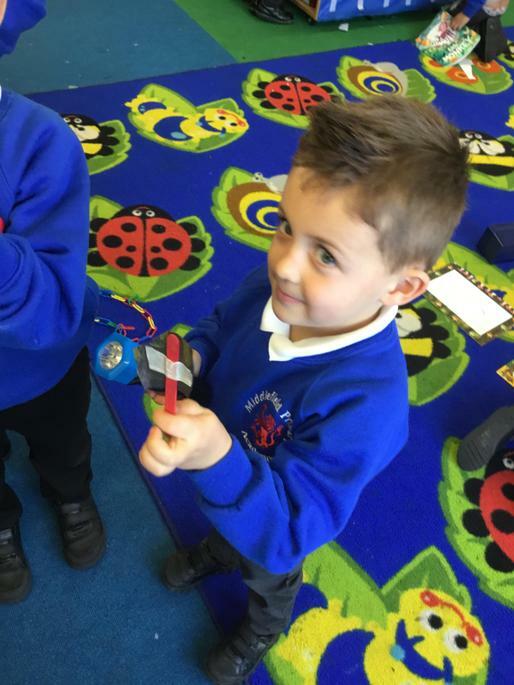 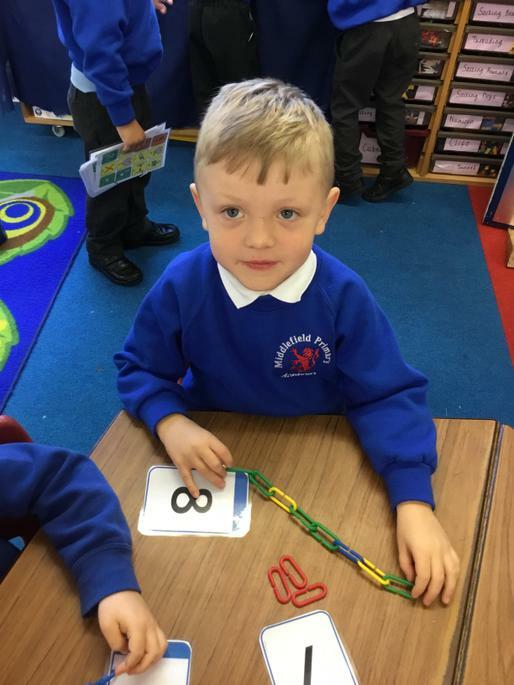 In maths we have been counting accurately and adding two groups of items together. 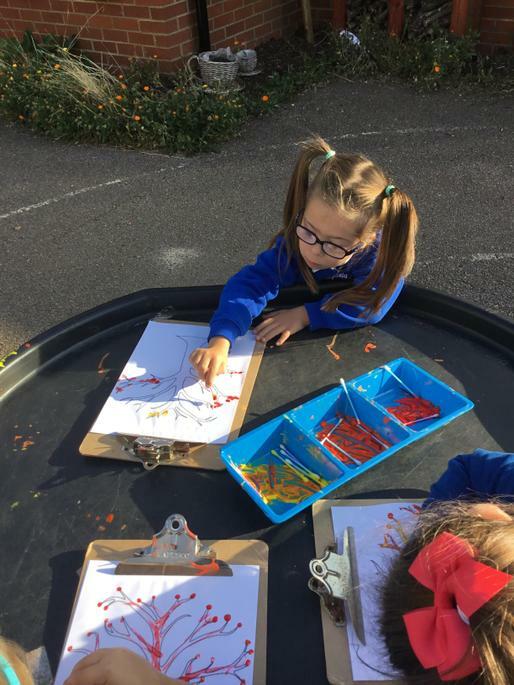 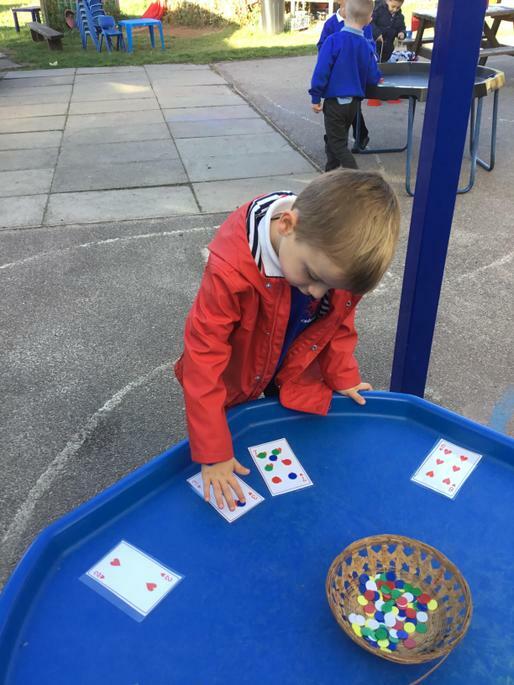 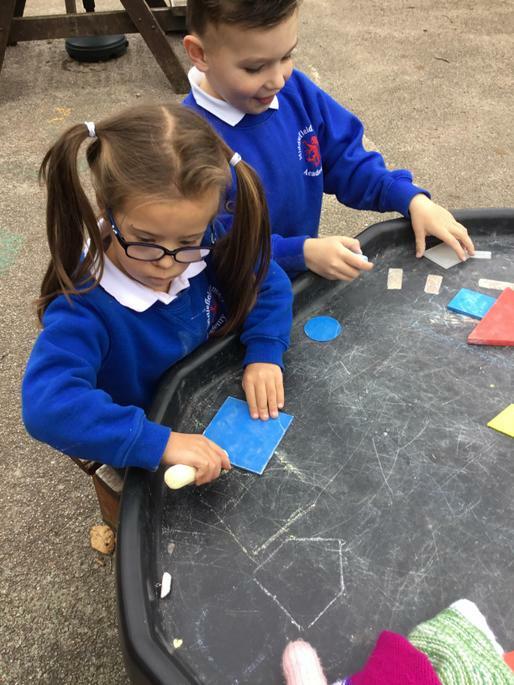 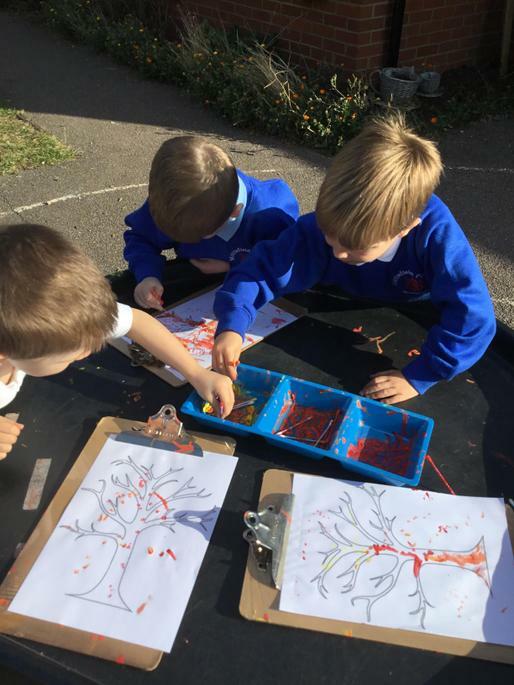 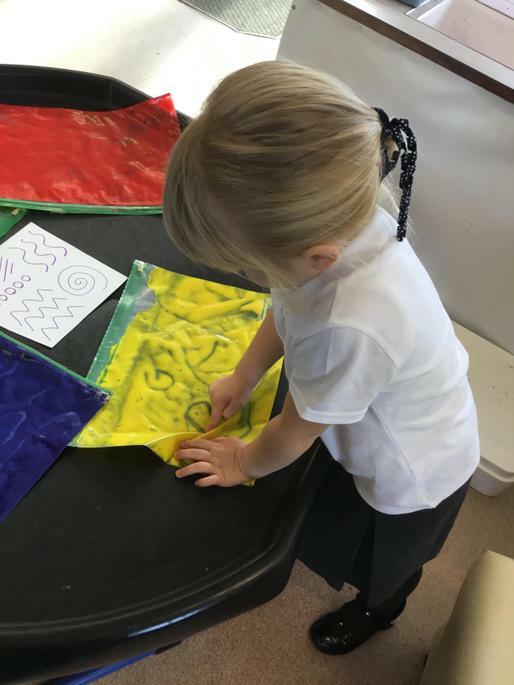 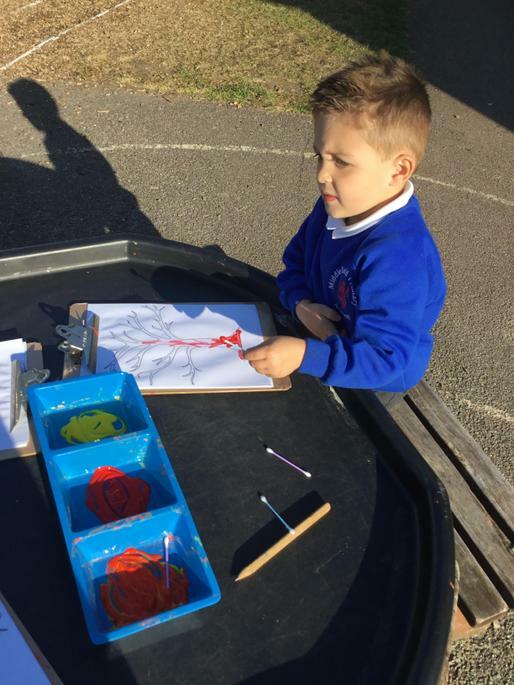 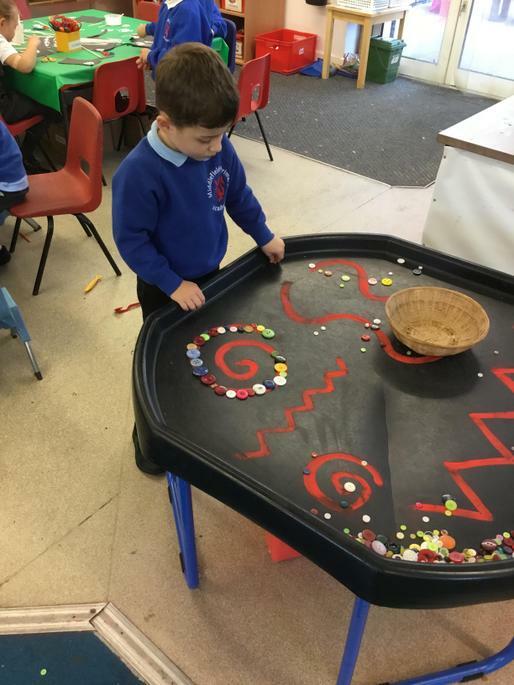 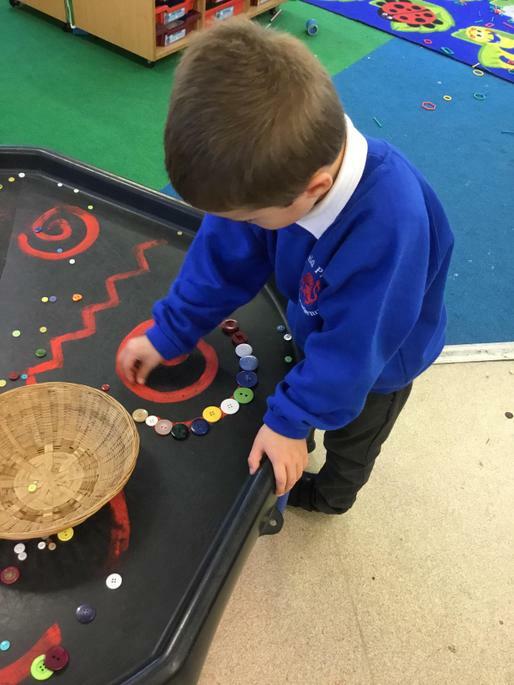 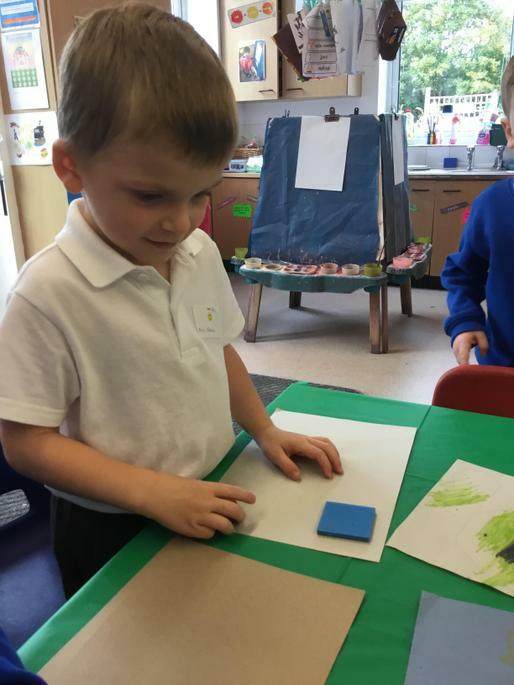 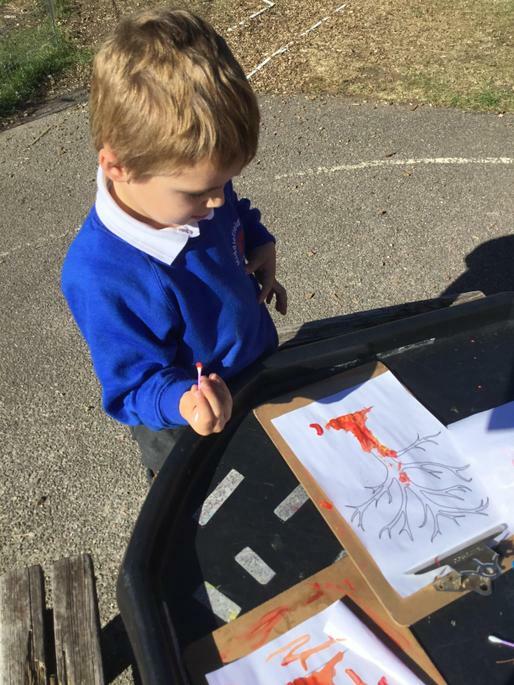 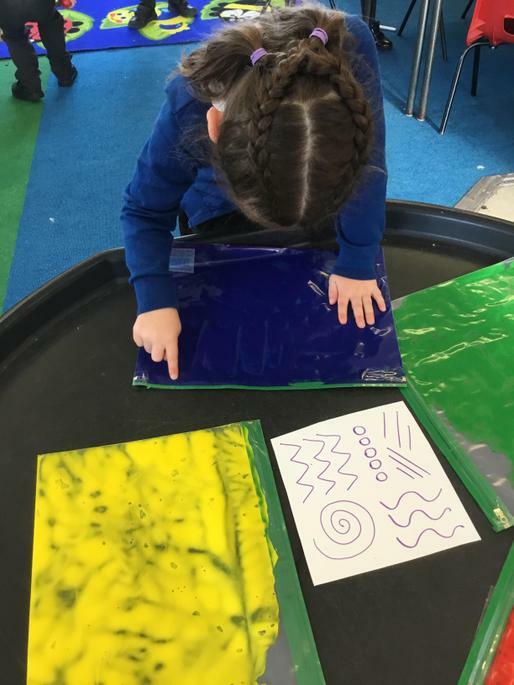 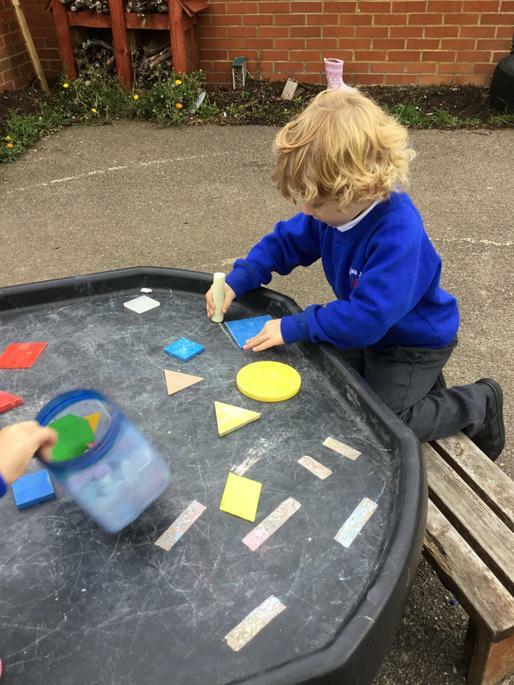 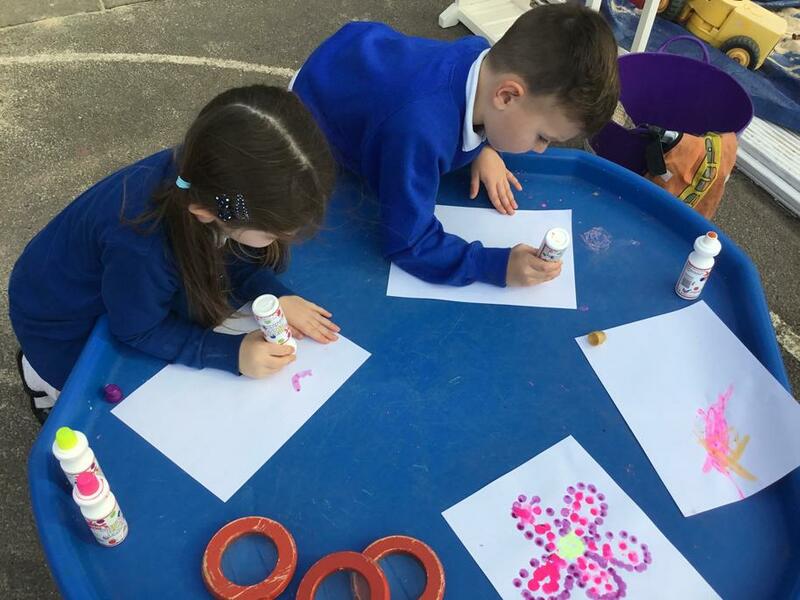 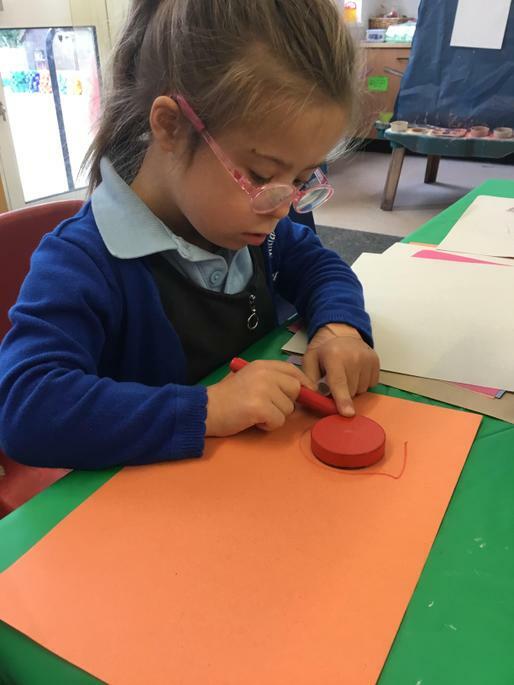 During their child initiated play, the children have been exploring magnets and paperclips, placing counters onto playing cards, painting autumn trees, and making patterns in paint! 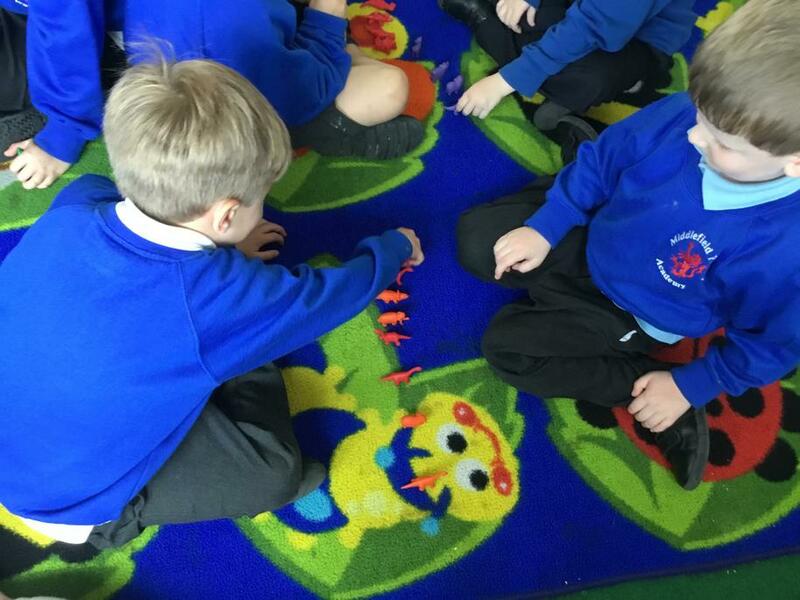 Next week we will be learning the story “Funnybones” in preparation for Halloween. 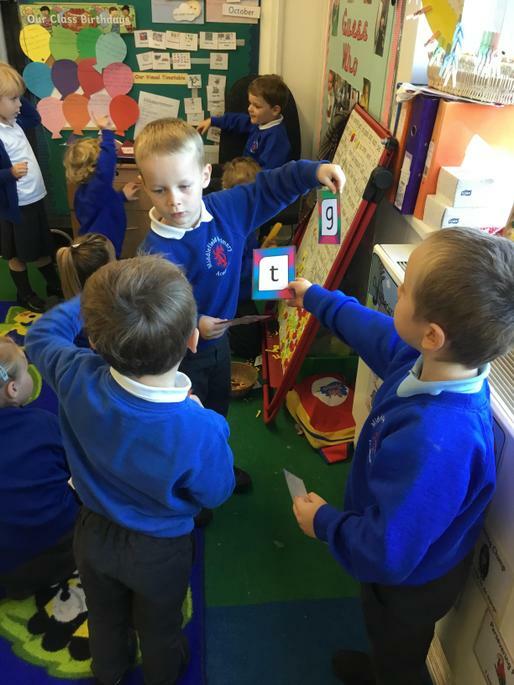 In phonics we will be learning the sounds “c, k, ck and e” and we will continue to segment and blend sounds together for reading. 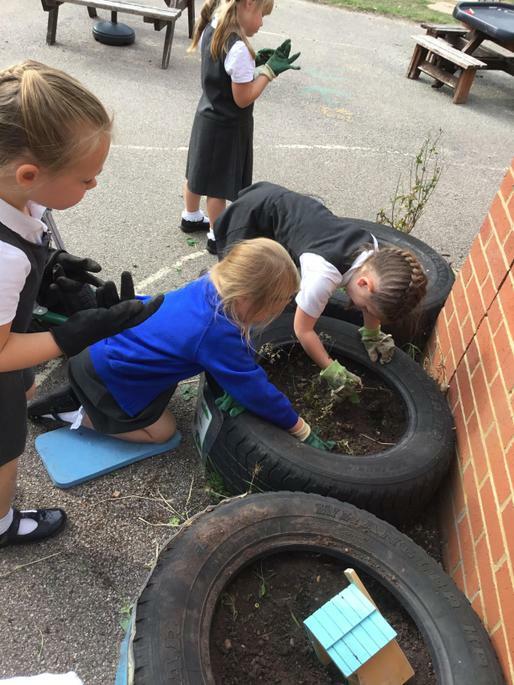 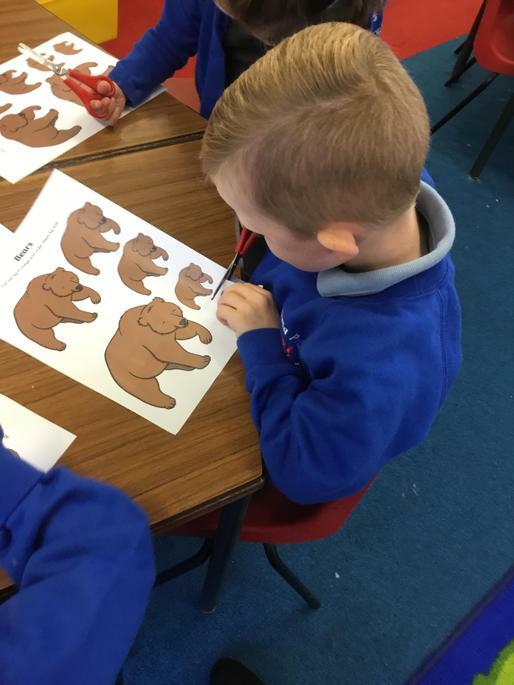 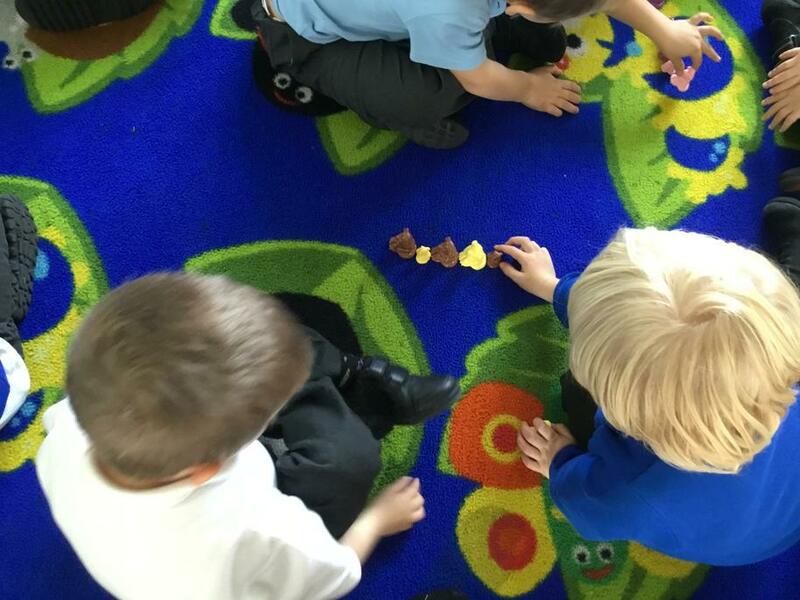 This week in Reception we have been learning the story “We’re Going on a Bear Hunt”. 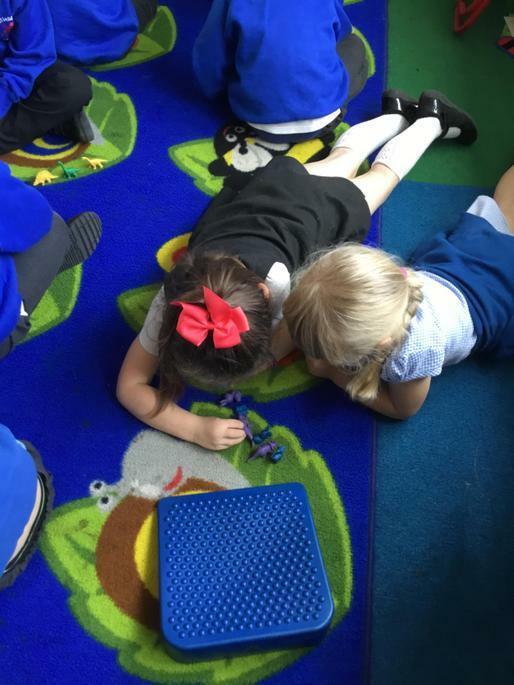 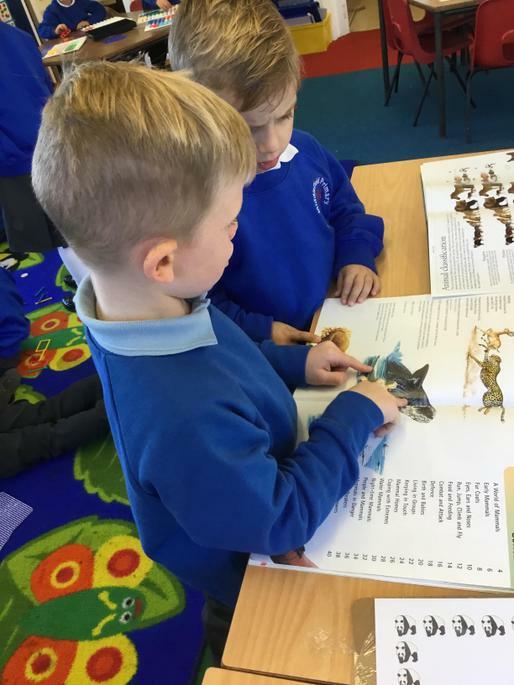 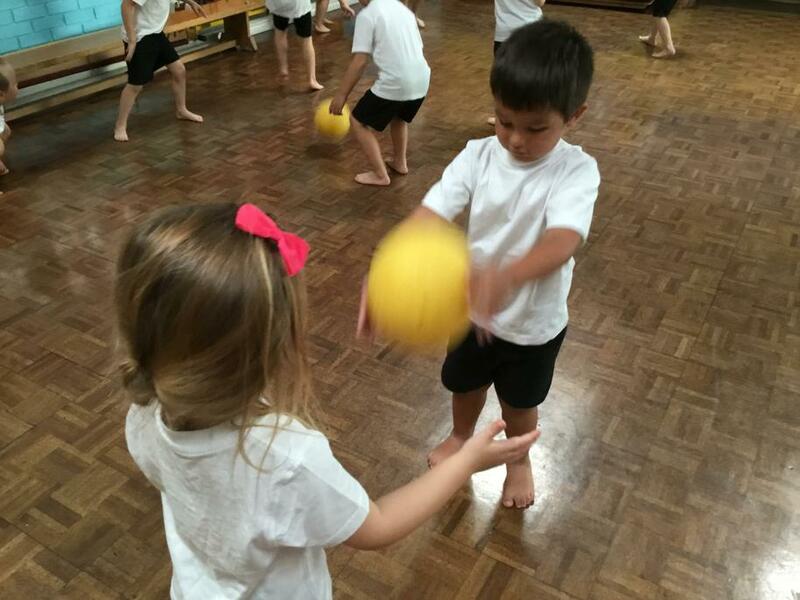 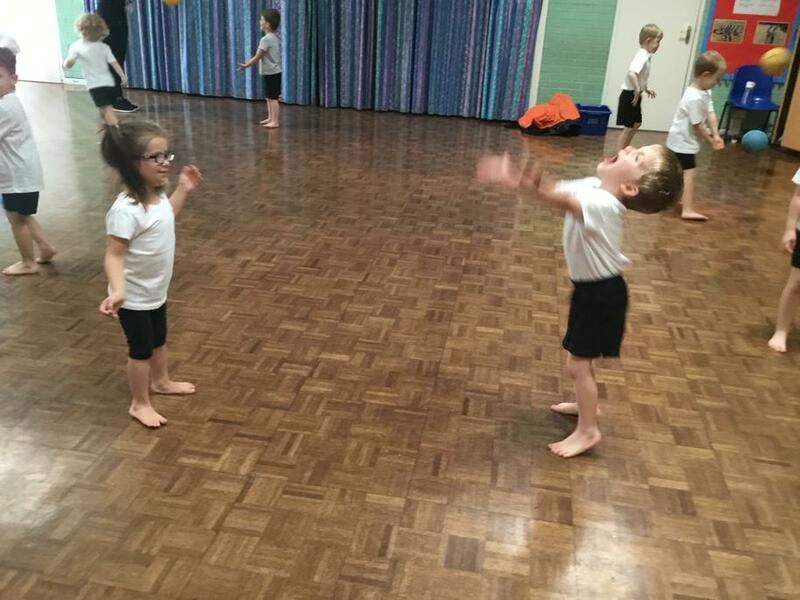 The children have enjoyed joining in with actions and repeated refrains in the story. 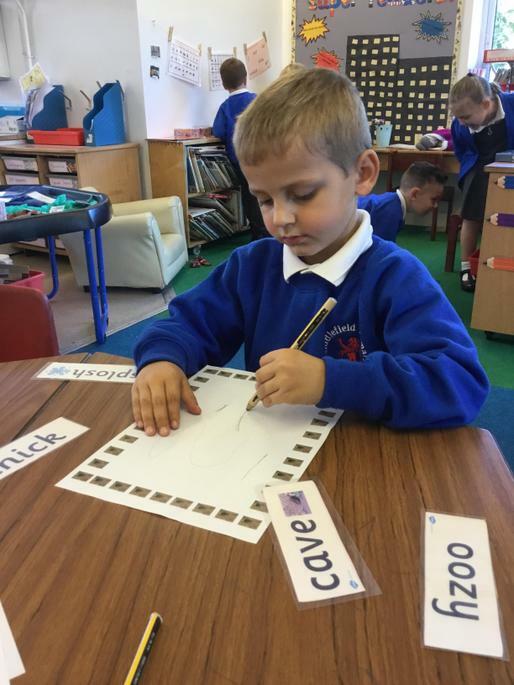 We have been very busy sequencing and ordering the story, describing each part and creating our own story maps using various materials. 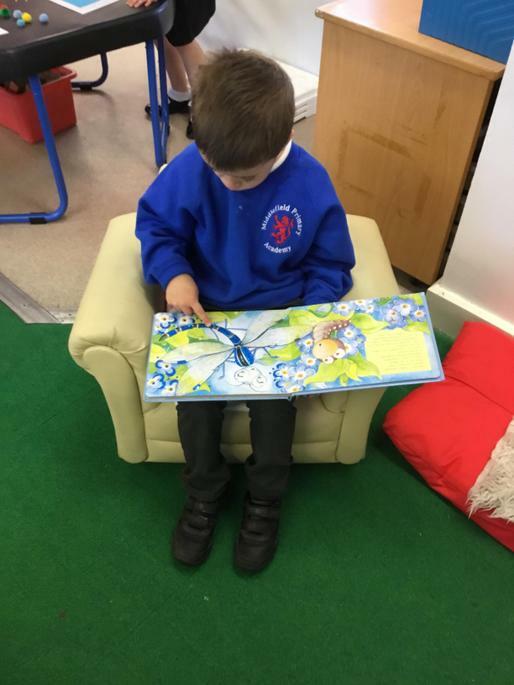 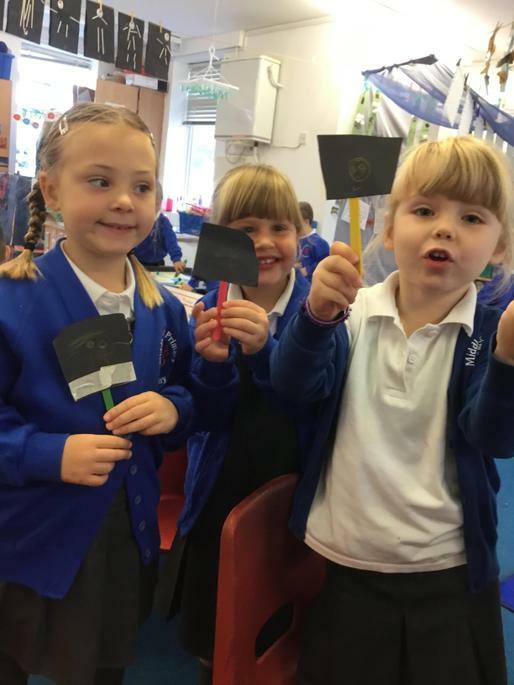 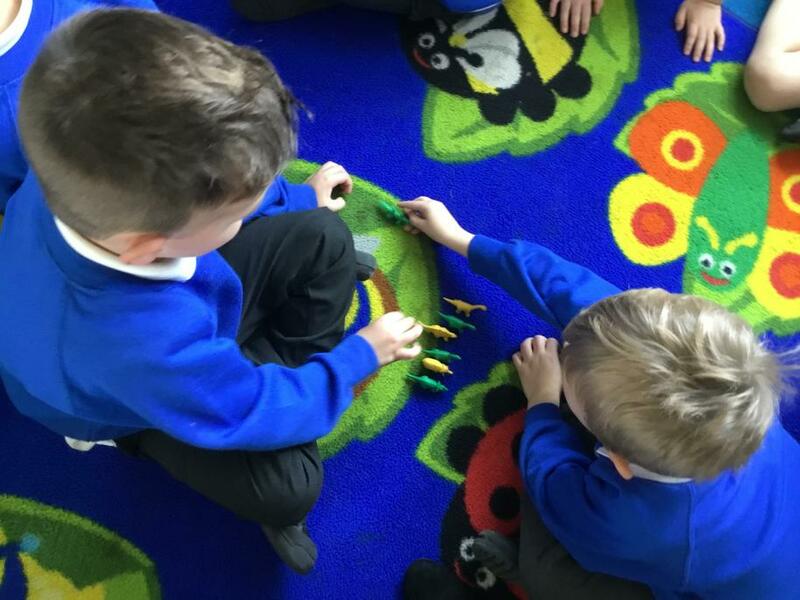 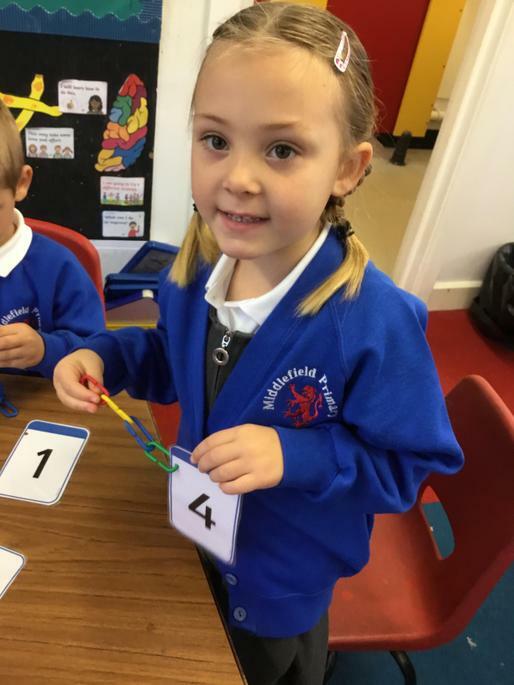 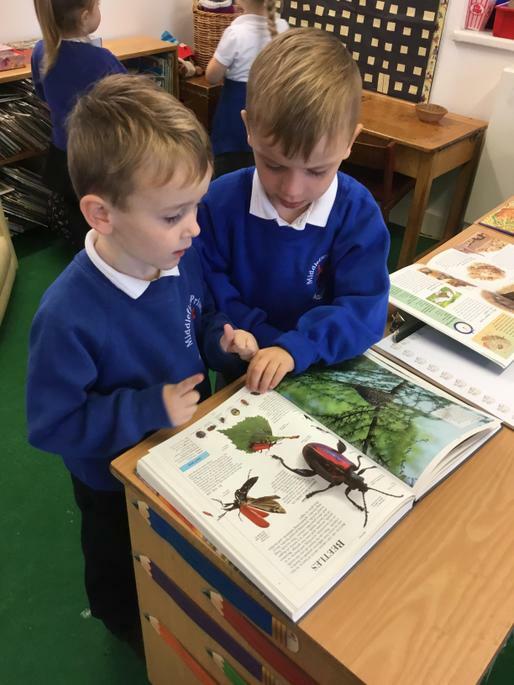 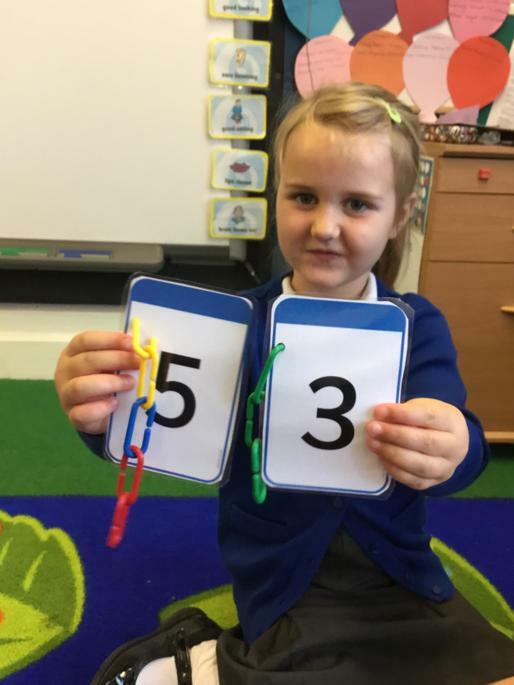 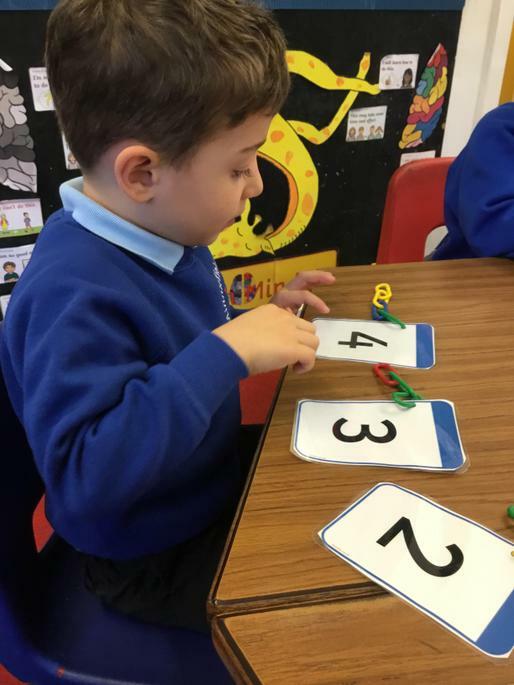 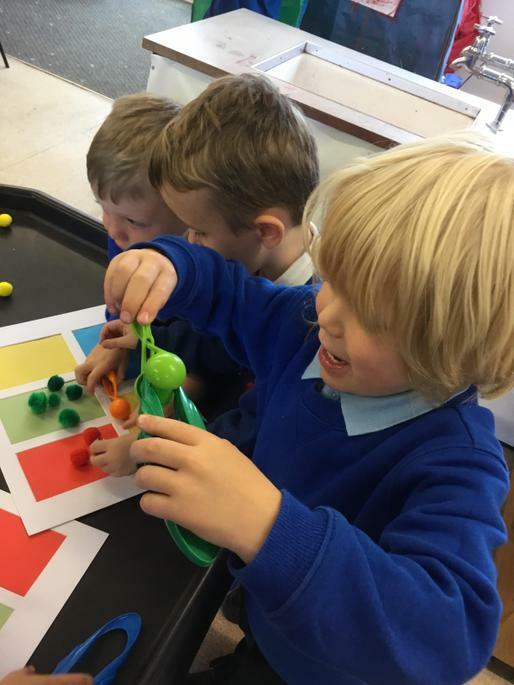 We have also been adding pegs to numbered teddy bears, exploring non-fiction books about animals and bears, and re-enacting the story during our child initiated play. 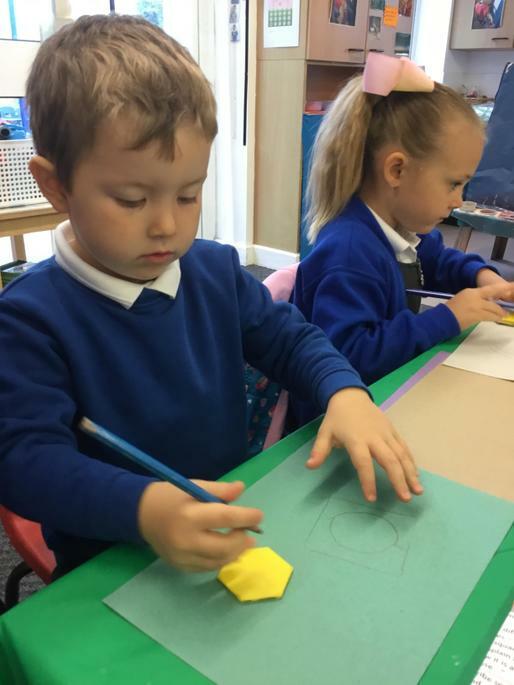 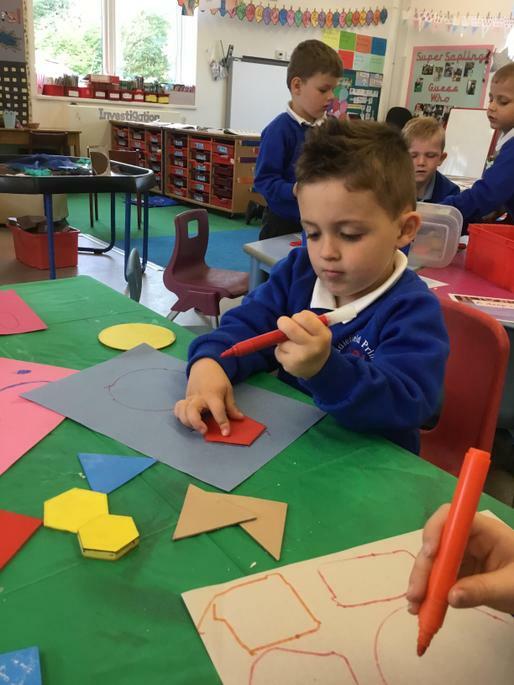 This week have looking at shapes and describing their properties – how many sides, how many corners, and that they are 2D and flat. 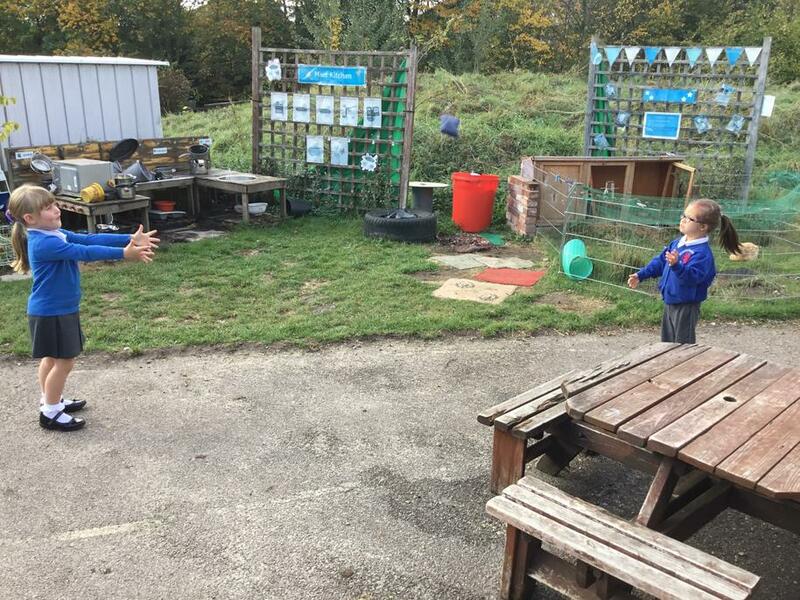 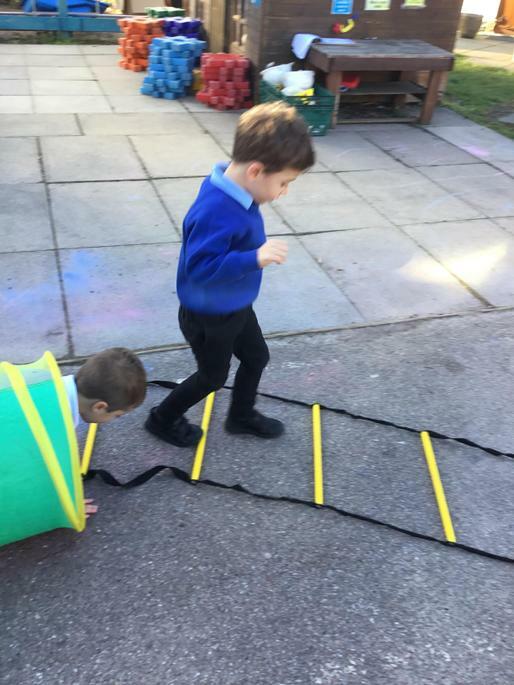 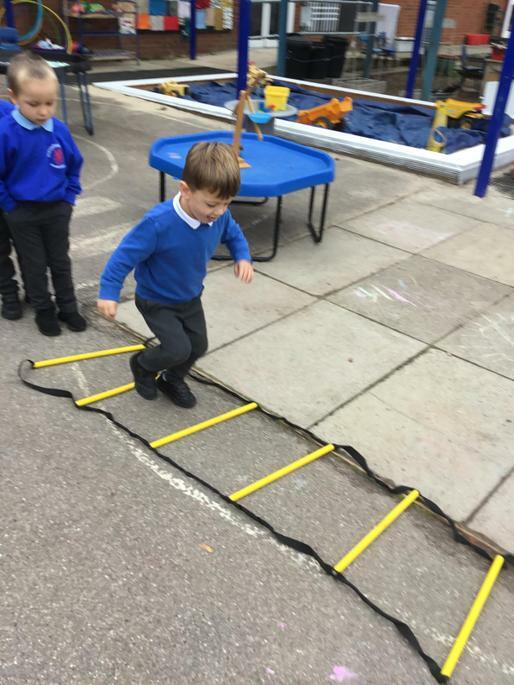 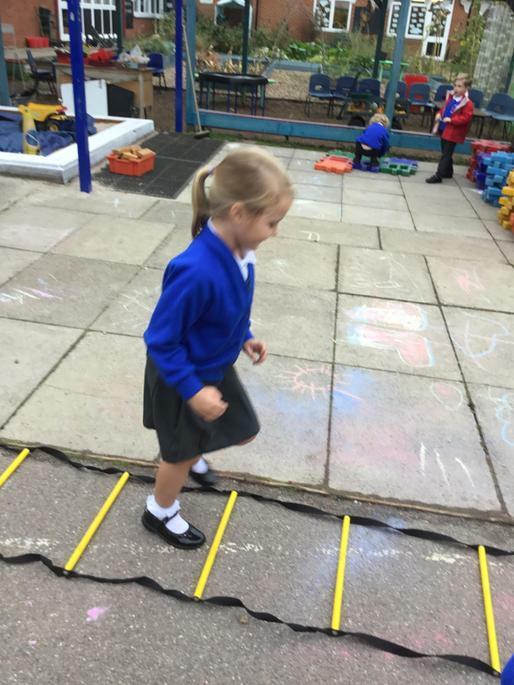 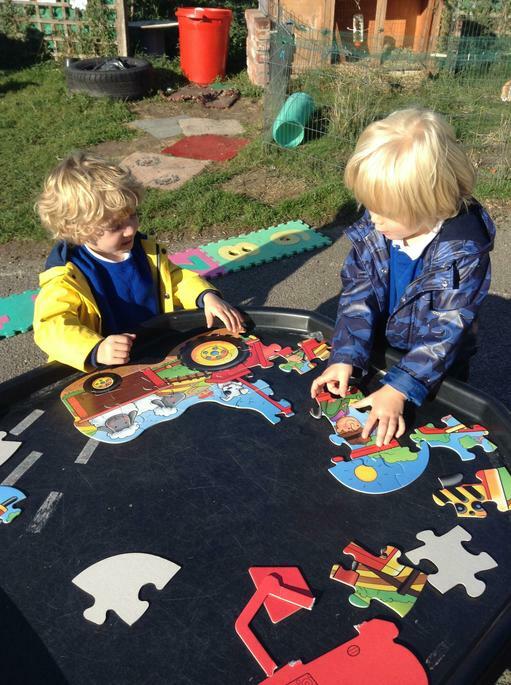 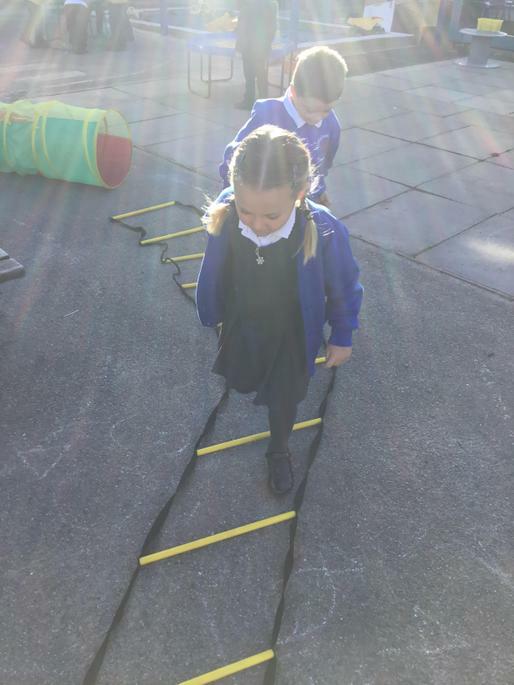 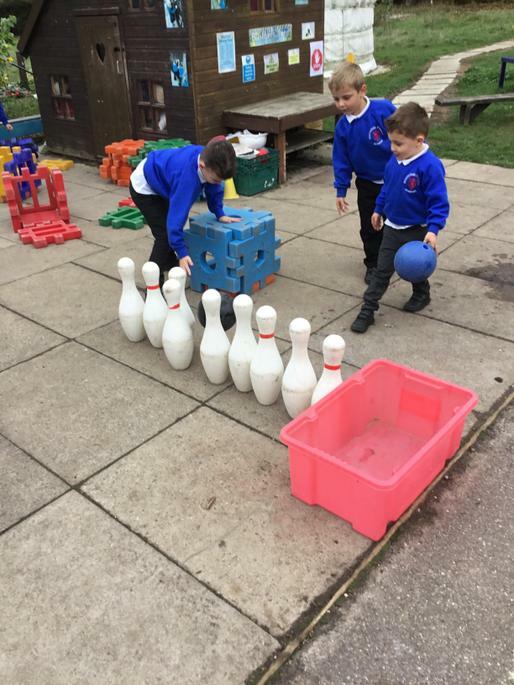 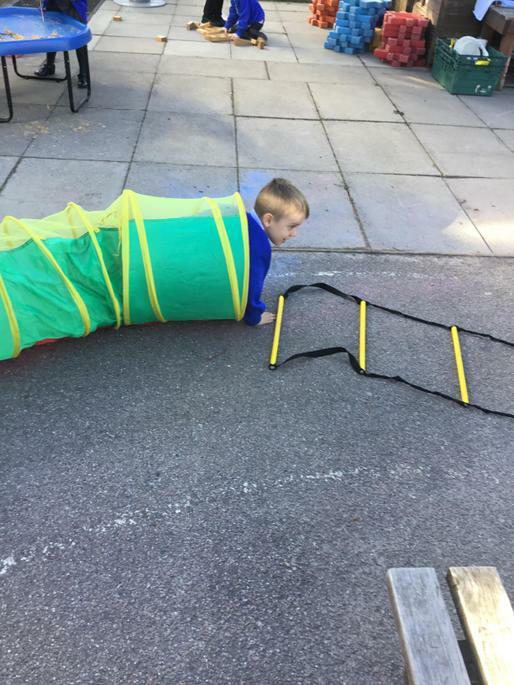 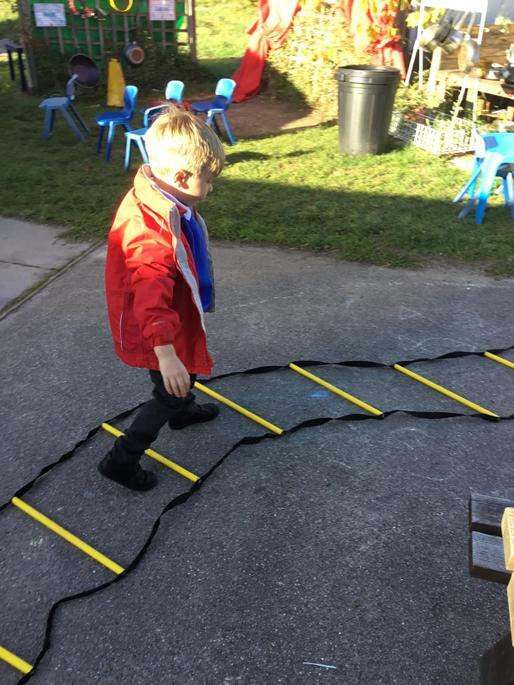 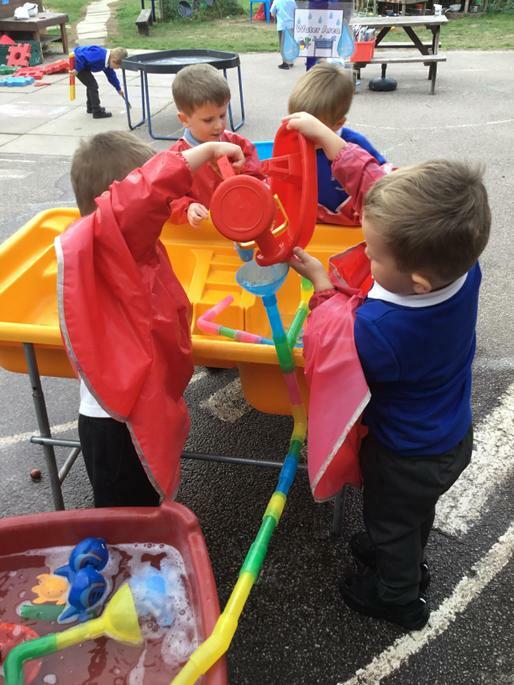 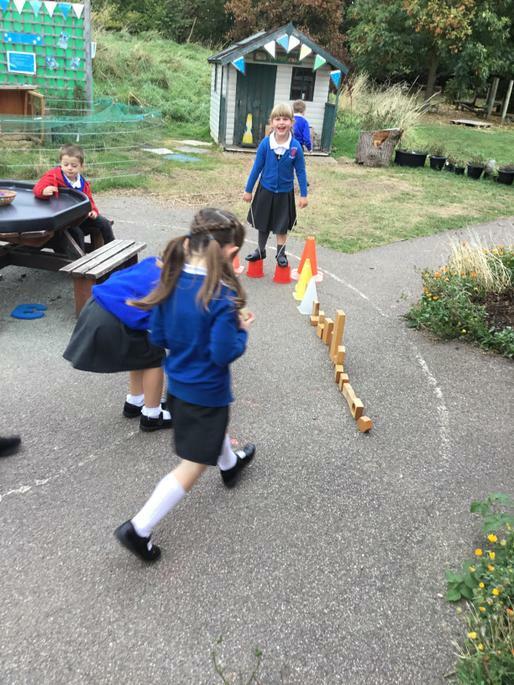 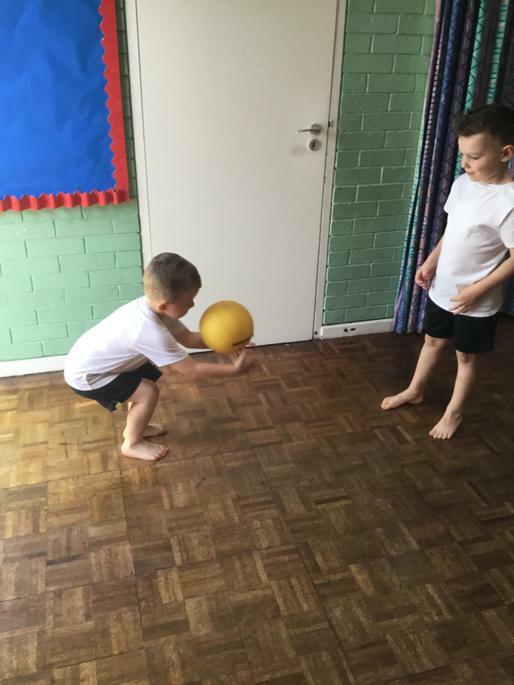 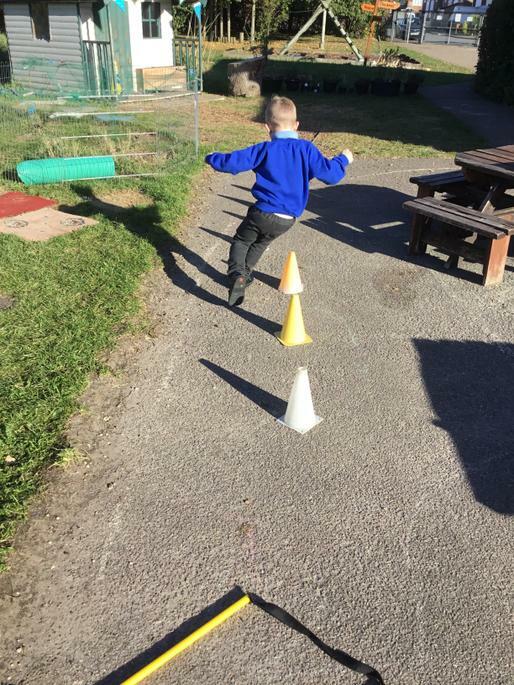 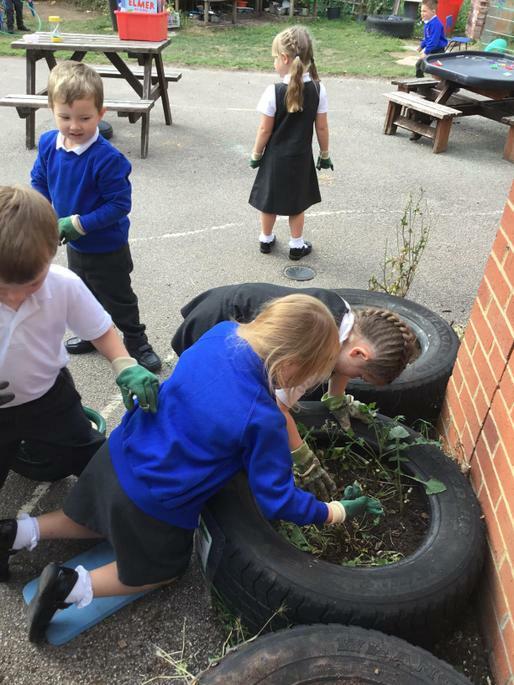 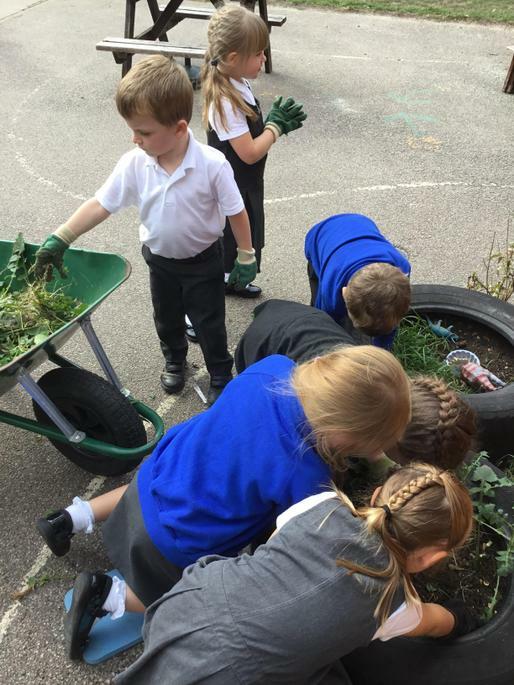 We have also been moving in different ways around our obstacle course outdoors! 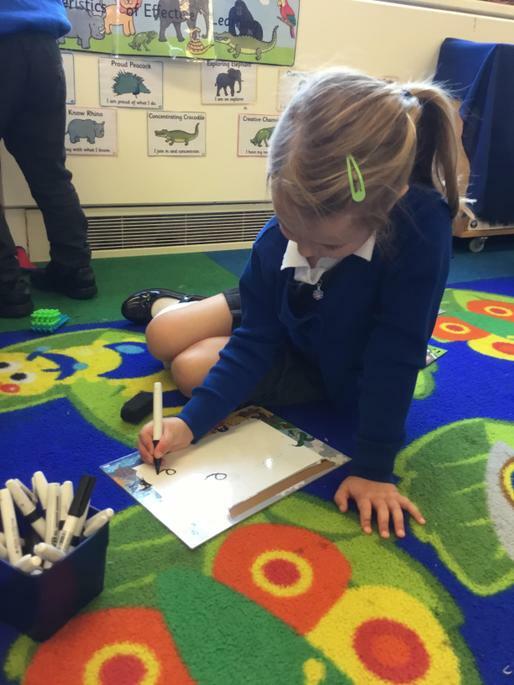 Next week we will continue to practise blending CVC words together, and we will learn the new sounds “d, g, and o”.